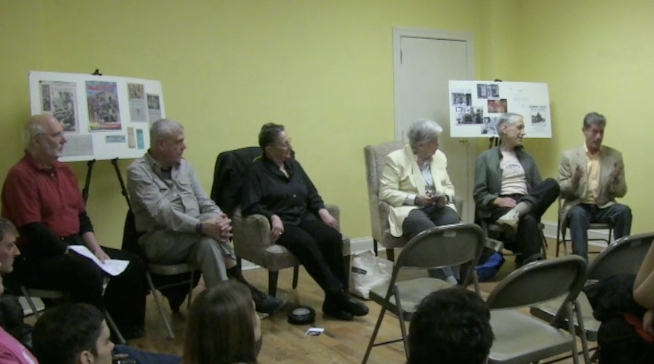 The Philadelphia Gayborhood Guru | Stories of how Philadelphia's Gayborhood came to be, featuring photos, artifacts and documents from the John J. Wilcox Jr. LGBT Archives. For all of you who are interested in Philadelphia’s LGBT history and culture in the Gayborhood and beyond, I’ve added a new Google map with over 700 locations for you to explore. They go from the 18th century to today and cover the greater Philadelphia area from Atlantic City in the east to Downingtown in the west, from Cape May in the south to Stroudsburg in the north. • Zoom in and out using the + and – box and click, hold and drag anywhere on the map to move from one place to another. •Click on the magnifying glass in the Map Legend on the left to search for particular places, events or people. • Click any pink triange to open a window about that site in the Map Legend. • Click again on the photo to see a slideshow of more photos. • Click the down arrow in the Map Legend to get more information about my sources. 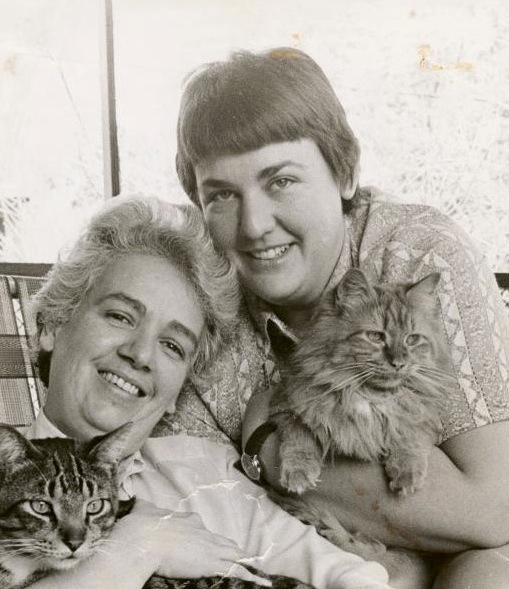 Have fun exploring the Philadelphia area’s amazing LGBT story! 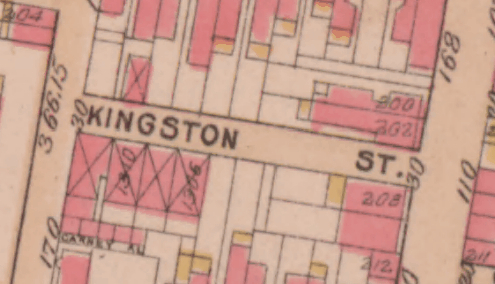 I know I haven’t posted here in a while, but for the past few months I’ve been focusing my attention on a new Facebook page called the Philadelphia LGBT Mapping Project. The Mapping Project was inspired by the recent National Park Service LGBTQ Heritage Initiative to identify places across the country that are important to American LGBT history. The broader scope of the project allows me to cover locales in the Philadelphia area that are both inside and outside of the Gayborhood. You’ll see some of the places in the Gayborhood I’ve covered here, as well as some new spots in the city that you may not be aware had LGBT historical significance. I’ll be adding new posts here from time to time, but meanwhile take a look at The Philadelphia LGBT Mapping Project on Facebook. The Lincoln, at the southwest corner of Camac and Locust Streets, mostly fits into the “Straight Snapshot” category, with a history that includes the YWCA, the Seamen’s Institute and a swanky nightclub. 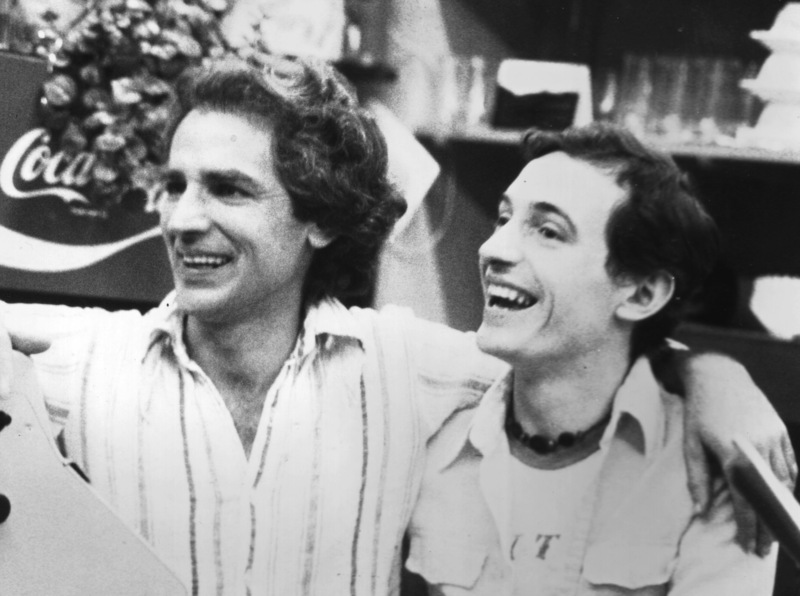 However, there was a brief, but important, LGBT connection in the early 1980s. Philadelphia grew at a tremendous rate in the second half of the 19th century. During the period from 1860 to about 1910, the city tripled in population from 500,000 to a little over a million and a half, just about what it is today. 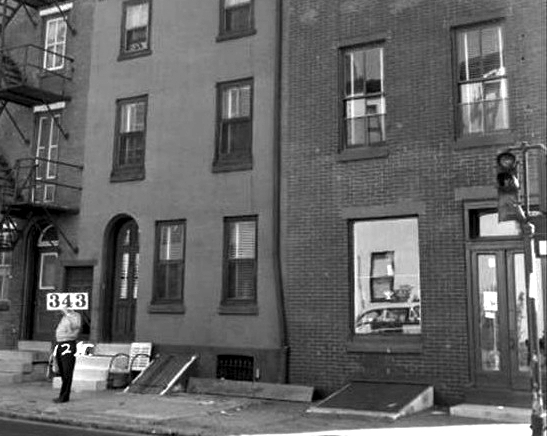 Along the southern edge of Center City, it was not unusual to find eight or nine families of immigrants crammed into three story rowhouses that were known as Philadelphia’s “horizontal slums,” left. For middle class Philadelphians looking for housing further west near the rising City Hall, new options were appearing. One of these was a recent concept called the “apartment hotel.” The apartment hotel took an already socially acceptable model for mutiple unrelated people to reside under one roof—the hotel—and extended it to families. Apartment hotels included not only rooms for rent by the night, but suites of rooms or apartments, that could be rented by the month. High end apartment hotels included dining rooms, barbers, hair dressers and laundry and maid service. Middle class Philadelphians could now maintain a convenient city residence to entertain in during the winter and still escape to their shore homes in the summer. 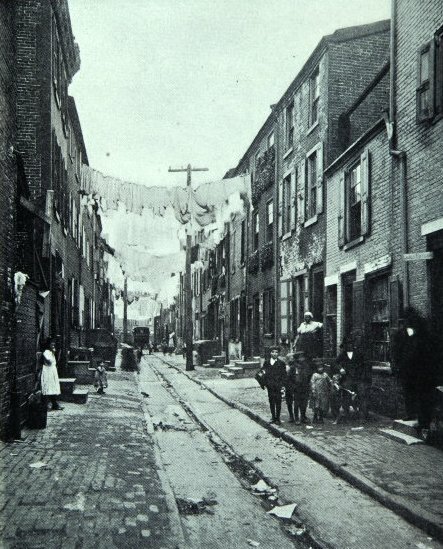 At the end of the nineteenth century, much of what is now Philadelphia’s Gayborhood was a desirable residential area. It was close to the business and entertainment district on South Broad Street, the shopping areas on Chestnut and Market Streets and the Library Company and Historical Society on Locust Street. One of the first of these modern apartment hotels was the Gladstone, completed in 1890 at Pine and 11th Streets, where Kahn Park now stands. 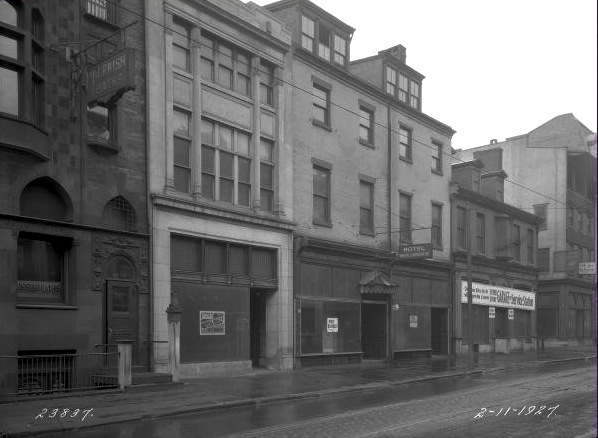 A few years later, the Lincoln, right, opened on Locust Street at Camac. The Lincoln had 52 “artistic and comfortable” rooms and 26 baths, a dining room, a sitting room and private rooms for luncheons and dinners. From the 1890s through the 1910s the Lincoln was home to upper middle class bachelors and comfortable bourgeois families who spent the summers at Cape May and hosted debutante parties for their daughters. One resident, Miss Elizabeth Crawford Washington, was a descendent of the grandfather of our first president. A member of the Colonial Dames of America, Miss Washington now lies in Laurel Hill Cemetery. 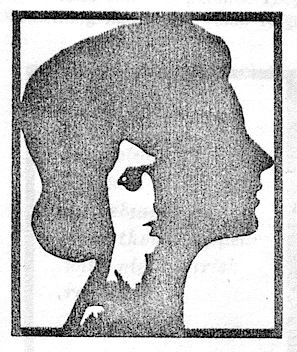 In 1920, the Young Women’s Christian Association bought the building and operated it as a league branch, the first hotel in Philadelphia exclusively for women. The YWCA toyed with the idea of renaming the building the more pointedly feminist “Betsy Ross Hotel,” but voted to stay with “The Lincoln.” They advertised to “business and professional women” and offered classes in dressmaking, homemaking, music and psychology. 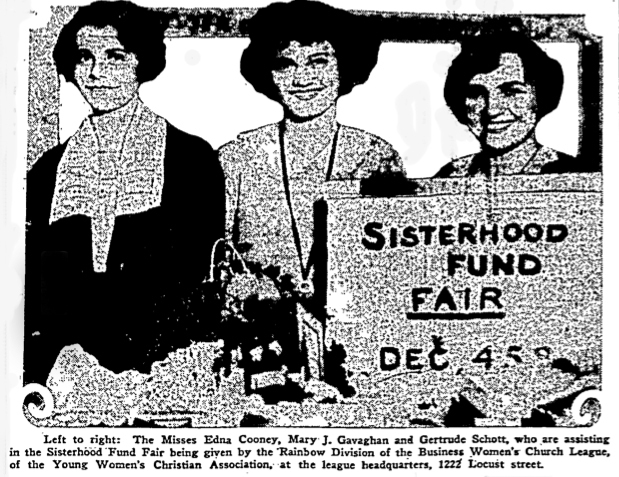 In 1922, their “Rainbow Division,” above, held a bazaar at the Lincoln to raise money for their Sisterhood Fund, which provided scholarships for girls who wanted to take educational courses. 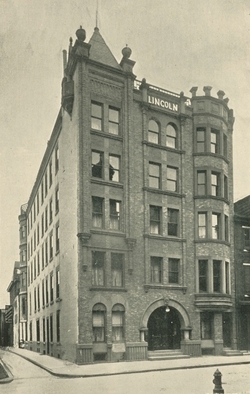 The YMCA continued to operate out of the Lincoln, providing a comfortable, safe place for women in Philadelphia until about World War II. 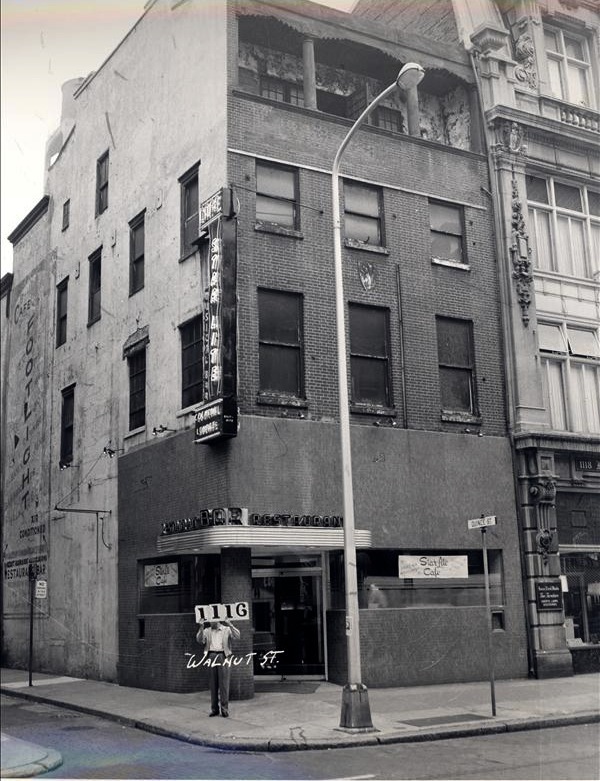 In the late 1940s, when nightclubs sprang up all over Locust, Camac, St. James and Thirteenth Streets, the first floor of the Lincoln was home to the Tabu supper club and musical bar. It was owned and run by Stanley Schwartz and Dominick DiMattia who also ran the Alhambra in Maple Shade, New Jersey. 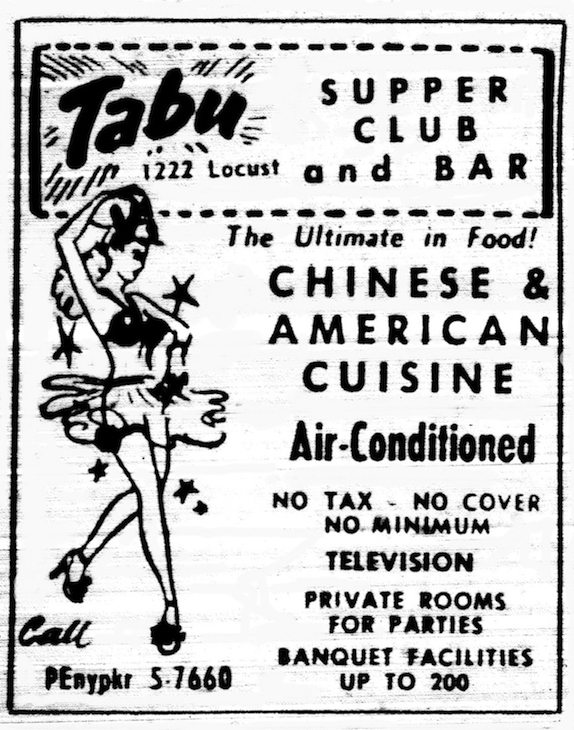 This ad for Tabu, right, and its “ultimate in food,” is from the 1953 Philadelphia Yellow Pages. 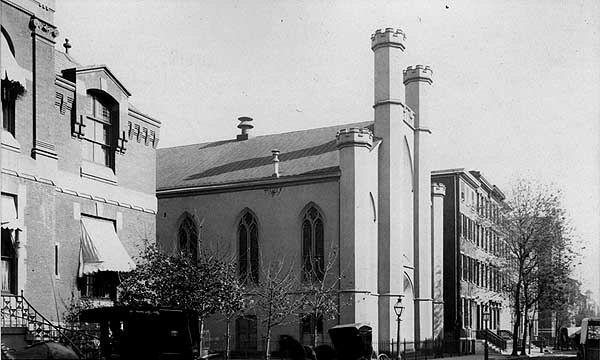 The Seamen’s Church Institute, founded in 1834, was an affiliate of the Episcopal Church. Its mission was to provide spiritual care, legal help and education to mariners. In 1957, when it lost its enormous city-block wide Walnut Street facility near the river to the plans for Independence Park, it moved into the Lincoln further west on Locust Street. 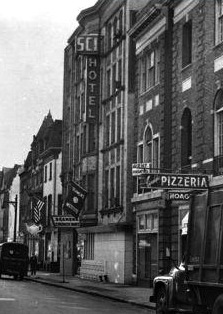 The photo, right, with the SCI Hotel sign, was taken in 1959, looking east from 13th Street. As the YWCA did for women, the SCI at the Lincoln offered not only beds but a social space for seamen, a haven where they could find wholesome recreation, companionship and moral support while stationed in Philadelphia. 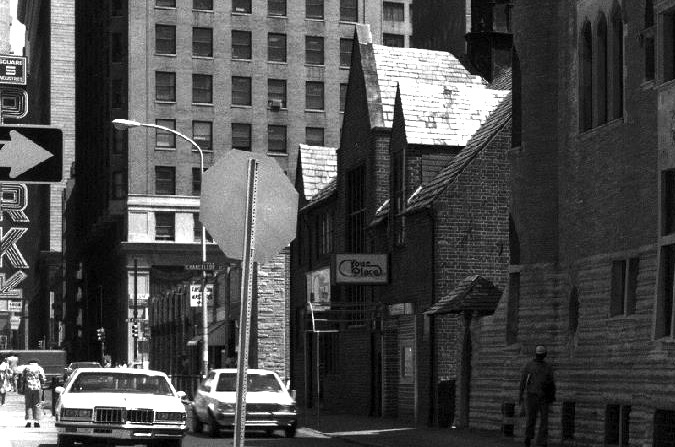 In 1974, the SCI relocated to the former Corn Exchange Bank in Old City at Arch and Third Streets, closer to the Delaware River. 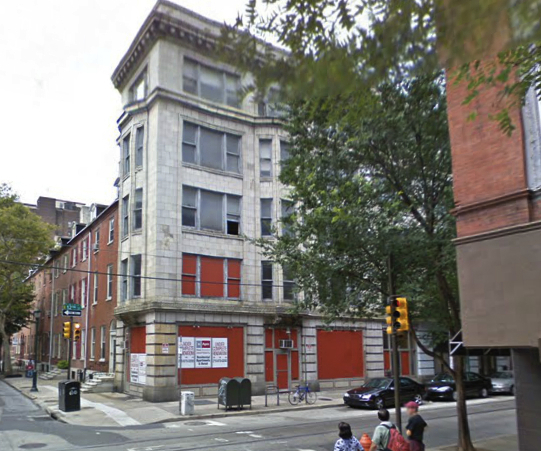 On November 27, 1981, the first Gay Community Center of Philadelphia on Kater Street closed its doors, to re-open a month later at 222 Camac St, in the former Lincoln Hotel, by then renamed The Midston. The photo, left, by PGN photographer Harry Eberlin, shows volunteers working on remodeling the space. They spent thousands of dollars and many hours making the aging structure usable. At the same time, the Center’s administration was reorganized from the old two committee system to a new Board of Directors, co-chaired by John Cunningham and Laurie Barron. 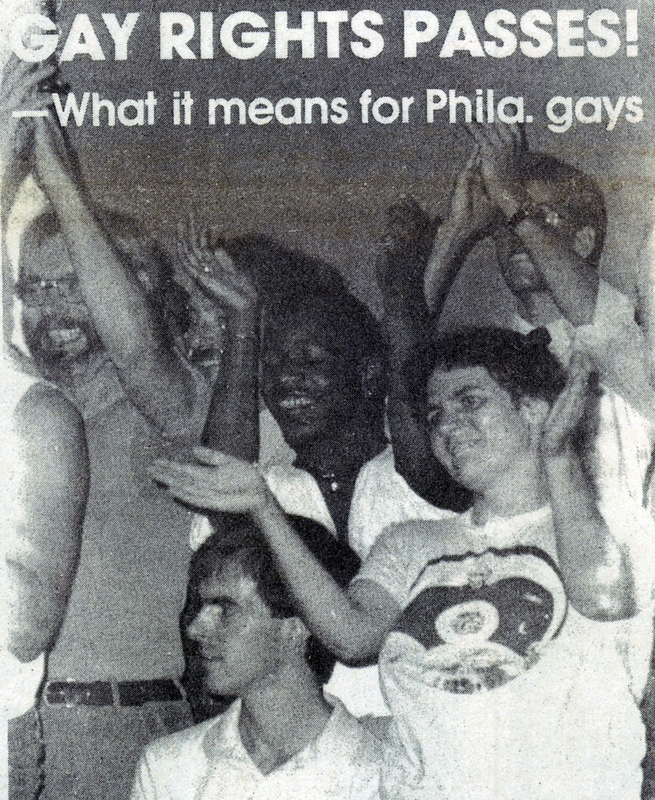 John is visible on the far left, in this PGN photo, right, taken a few months later, at a party at the Center celebrating the passage of the city’s gay rights bill in August, 1982. For about 10 years, the building continued to decay as The Midston, a ninety-two room fleabag hotel that rented tiny rooms by the hour and was the site of several stabbings. In 1984, during the first wave of the rehabbing of Locust Street, Historical Developers, Inc, bought the building for one million dollars and announced that they would spend another four million to renovate it into 46 luxury apartments. The firm’s president, Thomas Scannapieco said that the plan was to rent the units our for five years, then sell them as condominiums. It wasn’t until 2006 that the owner began that condominium conversion. New appliances and fixtures were being installed that summer, when a four-alarm fire broke out in the building on the night of June 30th. By the time firefighters had the flames under control, the upper story wooden joists had collapsed, crashing down through the lower floors. All that was left was the exterior walls. Locust Street was closed to traffic for weeks as cranes scooped out debris from the site. Neighbors were not happy. The building remained a boarded up shell for five years until rumors began to circulate in 2011. 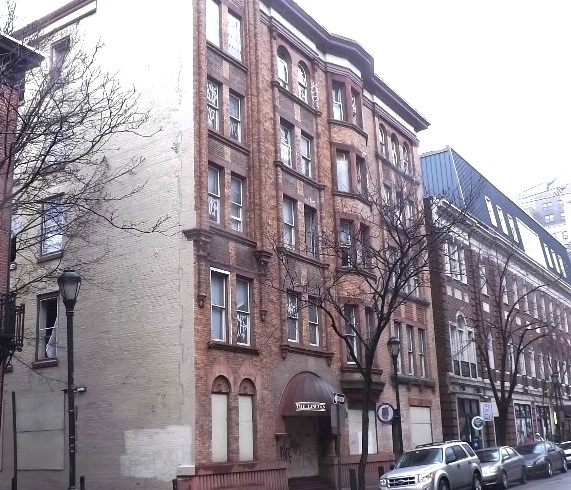 Cecil Baker and Associates presented a plan to renovate the building, that included preserving the exterior and creating 6 studio, 32 one bedroom and 6 two bedroom apartments for a total of 44 units. The Washington West Zoning Committee voted not to oppose the project, but nothing happened. In September of 2013, rumors again circulated that new owner David Perelman of Pelican Properties had plans to renovate the property. In June of 2014, Philadelphia Magazine confirmed that work was due to start soon. A few weeks ago, in August of 2014, fencing appeared around the Lincoln, left. If work continues, the Lincoln will reopen to a very different neighborhood than Locust Street was just eight years ago in 2006. The hundred year old structure is now surrounded by several new restaurants including Vedge, Little Nonna’s, Green Eggs Café and Nomad Roman, not to mention the string of popular new spots on the 13th Street corridor. Across narrow Camac Street, Uncle’s has been reborn as U Bar. The same nearby amenities that made the Lincoln Hotel a desirable place to live in the 1890s make it just as desirable today. 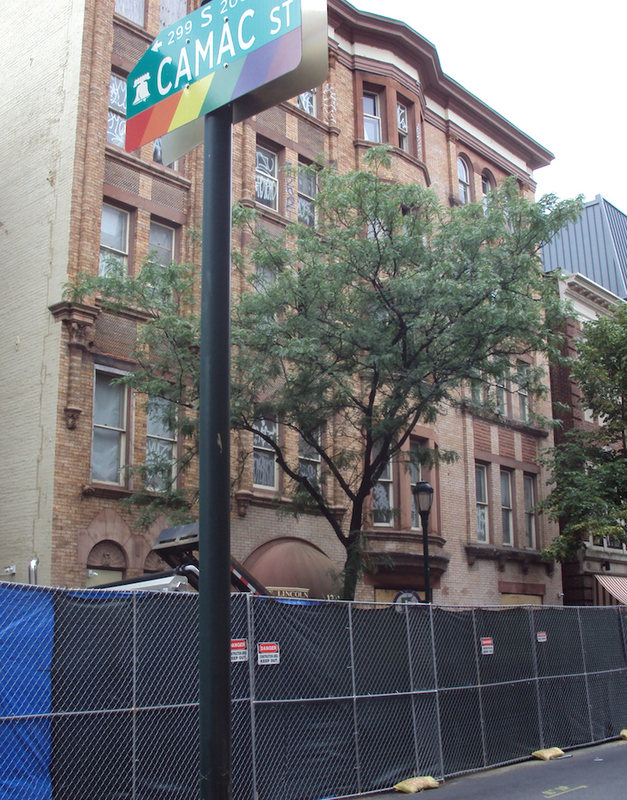 The face of the Gayborhood has changed while the derelict building slumbered. 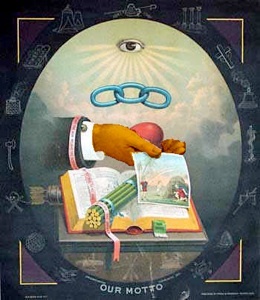 Oddfellows lodges began as fraternal organizations and “friendly societies” in England in the 18th century. Here in America, most lodges were part of the Independent Order of Odd Fellows, which had split off from the original order in 1813. 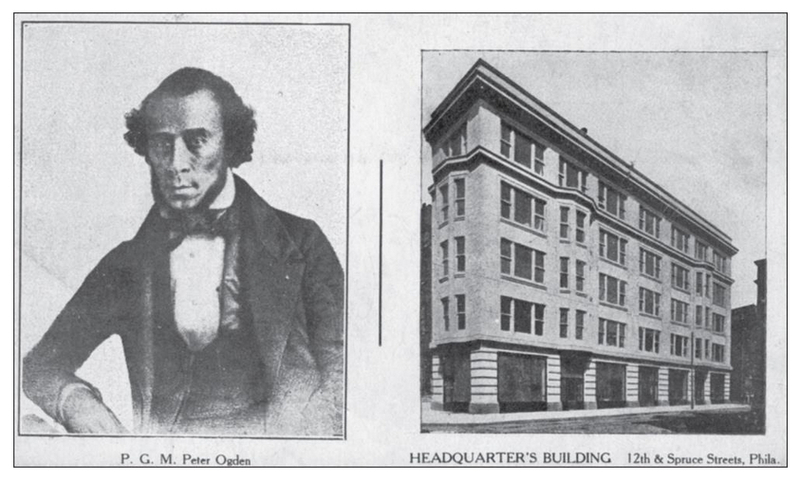 In 1843, the African American Philomathean Institute in New York petitioned the IOOF to form their own lodge. Because of their color, they were treated with contempt and their charter was refused. A Jamaican born sailor, Peter Ogden, left, heard of the Institute’s efforts and offered to apply for a charter for them through his own lodge in Liverpool, England, which was part of the Grand United Order of Odd Fellows. The Victoria Lodge in Liverpool didn’t hesitate to grant Ogden a charter. In 1844, the Philomathean became the first GUOOF lodge in America. A few weeks later, Unity Lodge No. 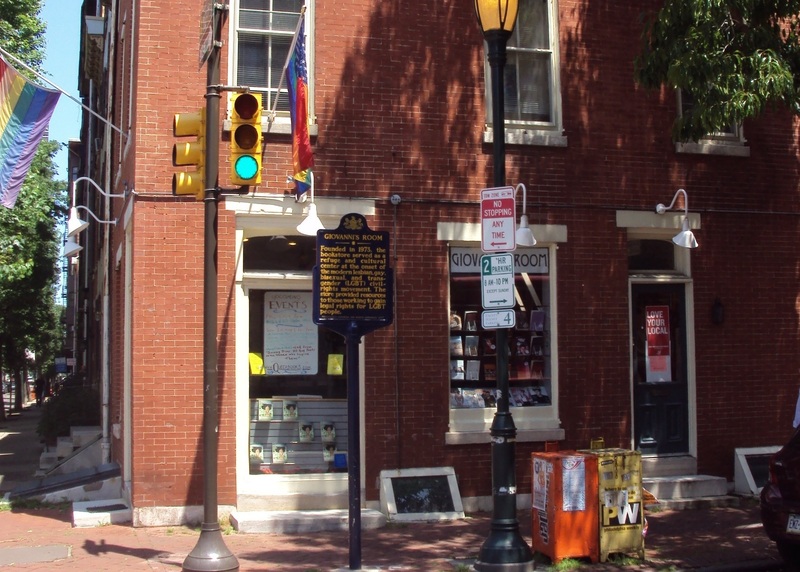 711 in Philadelphia became the first African American Odd Fellows lodge in Pennsylvania. Instrumental in the founding of the Unity Lodge was John C. Bowers, right. 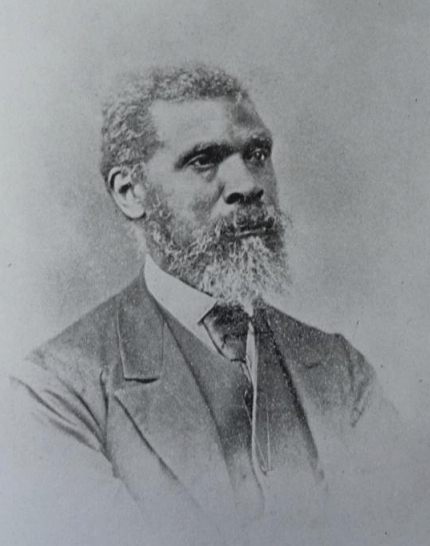 Bowers was a Philadelphia abolitionist and civil rights activist whose story has largely been overlooked. He served as organist at St. Thomas African Episcopal Church, ran a clothing store at 71 S 2nd Street and was the secretary for the weekly newspaper, The Colored American. In 1862, he spoke out publicly against Lincoln’s plan to remove some five thousand black Americans to Haiti. 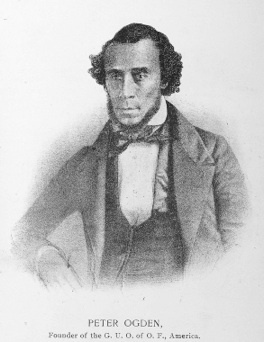 The Philadelphia Inquirer wrote of him, “[John C. Bowers] was an active and enterprising citizen, warmly interested in all plans for the advancement of his people, [and] prominent in his hostility to slavery.” Since its beginnings, Philadelphia has always produced a wealth of strong black leaders. By 1900, the GUOOF had grown to be the largest black fraternal organization in the country. 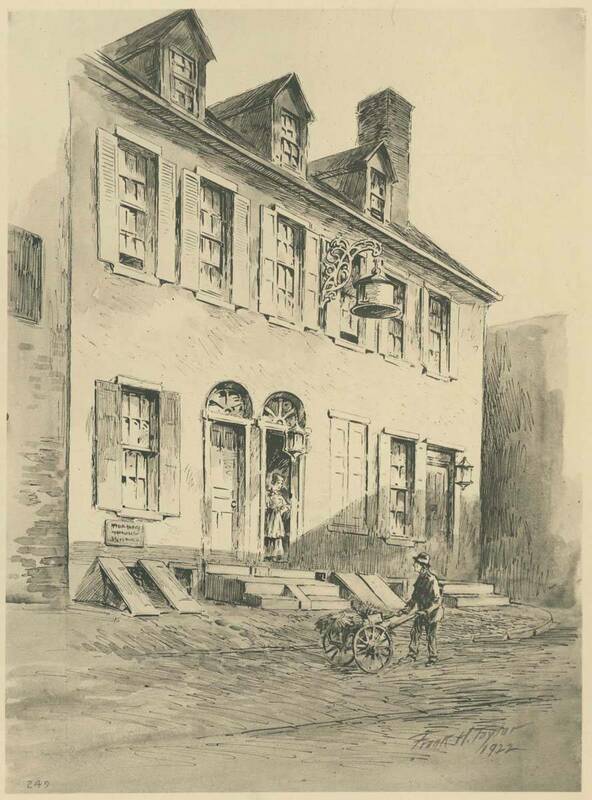 Now headquartered in Philadelphia, it owned two buildings and had 19 lodges with over 1,000 members in the city. 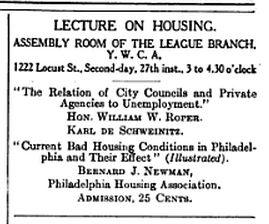 The Philadelphia organization even published its own newspaper, The Odd Fellows Journal. In 1905, the Grand United Order, operating from cramped offices at 602 Spruce St., hired architects Frank Watson and Samuel Huckel Jr. to design a new headquarters for them on the northwest corner of Spruce and 12th Streets. The slim five story Beaux Arts style office building they built neatly filled the narrow 120 foot long, 20 foot wide corner lot. The GUOOF would use that location as their headquarters for the next hundred years, renting out office space in the top four floors to other organizations and leasing the first floor to retail and commercial businesses. By the middle of the 1970s, the surrounding area was changing. 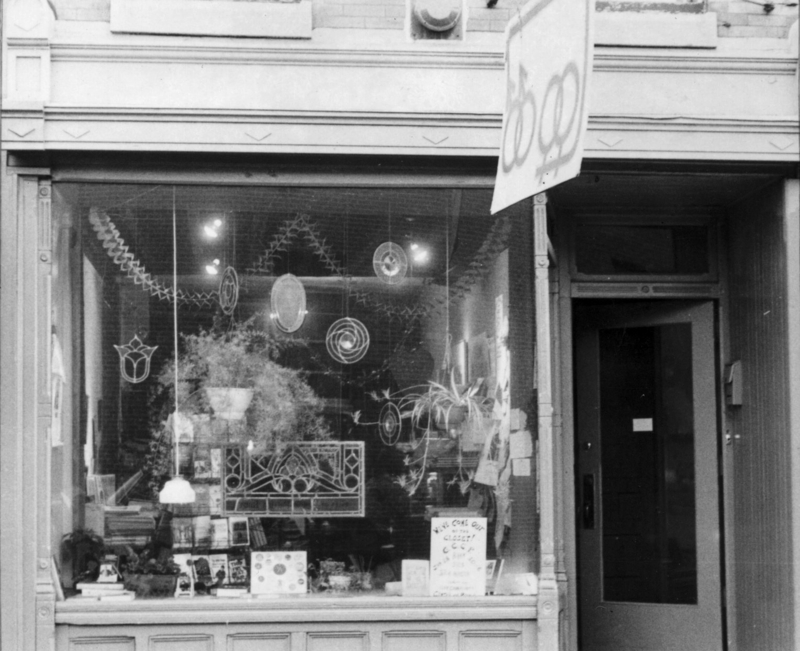 What had been a marginalized section of Center City with a few seedy bars was becoming a real neighborhood with gay owned bookstores, health clubs and cafes. 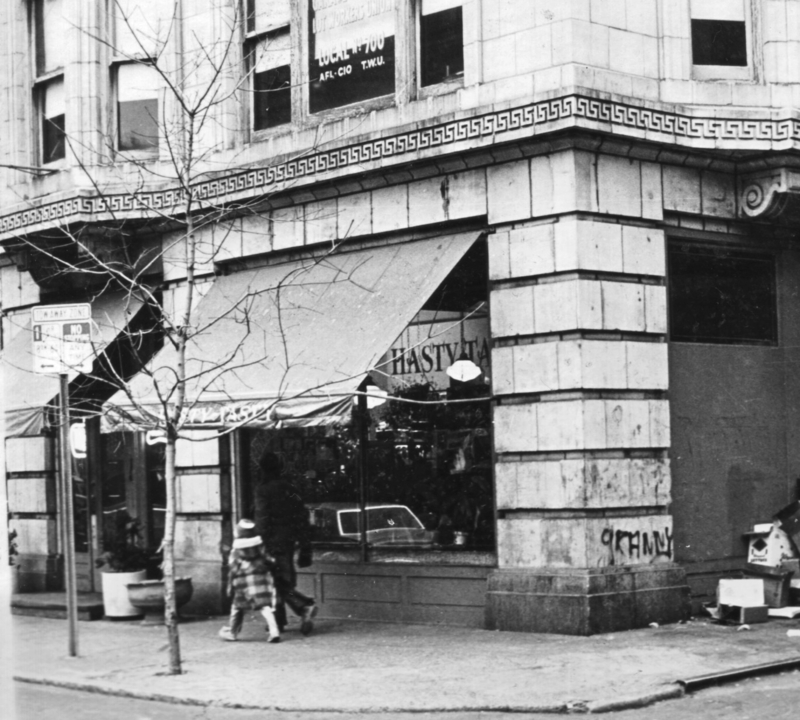 In 1975, restaurateur Jack Friel and his lover John Winfield opened the Hasty Tasty deli in the Odd Fellows building, above. 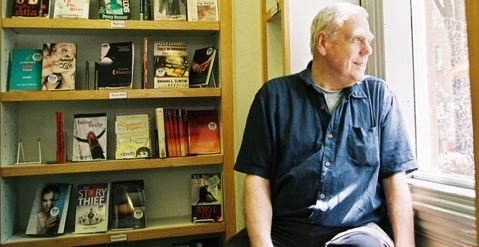 Friel was a prodigiously active entrepreneur in the expanding Gayborhood. At various times he owned Seasons on Drury St., Bramwell’s on Camac St., managed the Back Street Baths on Chancellor and worked with the Metropolitan Community Church. 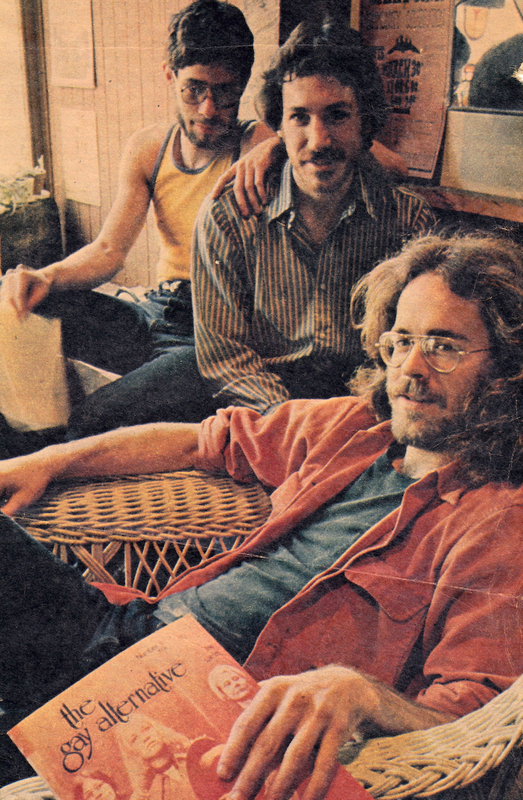 Jack , John and Dickie Lance, pictured below, ran the popular Hasty Tasty from 1976 until 1980. 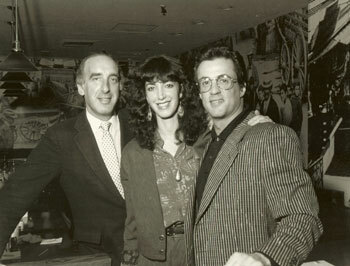 Jack sold the business to Larry Wenograd and Bob McCarthy, who ran it for two years as Windows on 12th, inspired by Windows on the World at the top of the north tower of the World Trade Center in New York. It then became the Land of Pizza for two years. 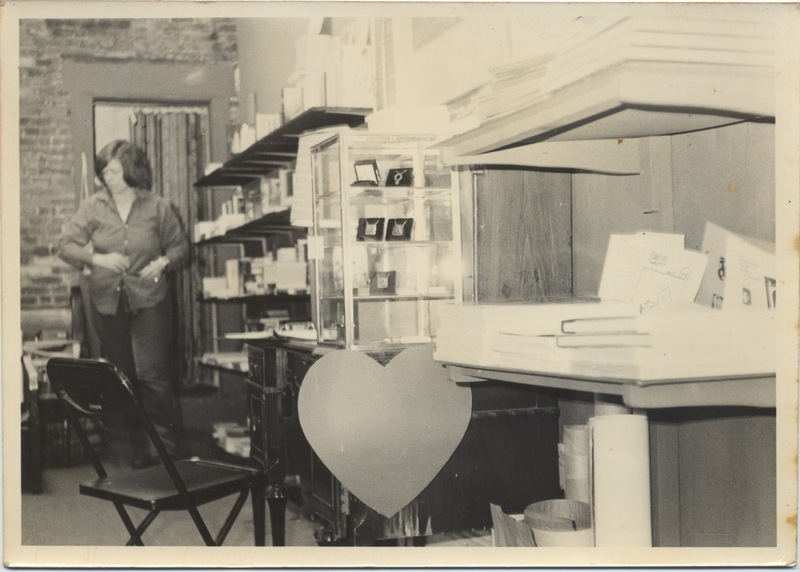 On June 1, 1984, Gayborhood icon Franny Price opened Spruce Street Video, left, on the floor above, advertising it as the first gay video store in the country. 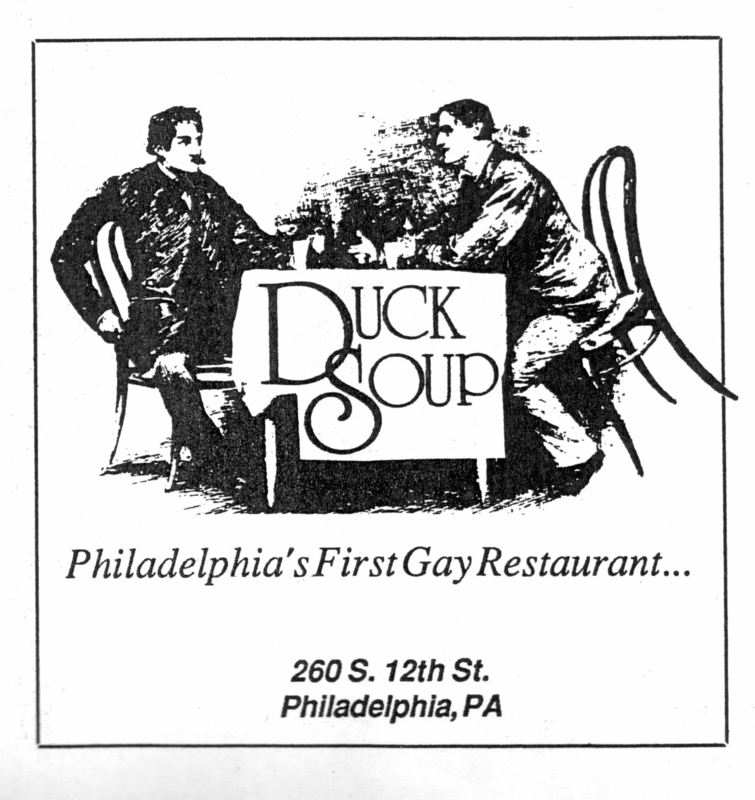 The street level restaurant then became Duck Soup, see ad above, from 1987 to 1995. 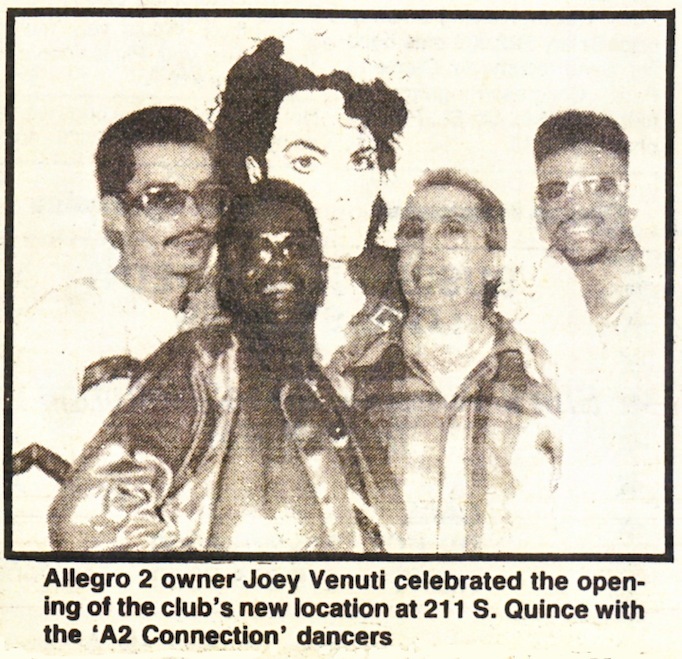 The space would see its last incarnation as a late night gay hangout when Cheap Art, below, opened there in 1995. Cheap Art closed in the early 2000s and Spruce Street Video moved a few doors down to 252 S 12th St. The short lived HX Philadelphia magazine rented office space in the building from 2006 to 2007. In 2008, the Odd Fellows relocated their headquarters to Virginia. That marked a low point. For a few years, the building was boarded up and took on a forlorn, abandoned look, below. The GUOOF sold the building to APM Realty in 2009 and things began to look up. Permits and variances took time to get. 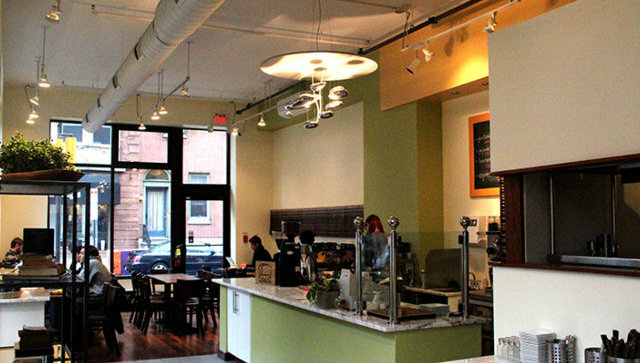 The Spruce Street finally opened on February 5, 2012 as The Odd Fellows Cafe, run by Betty and Faith Ortiz, who also owned Spruce Street Espresso a block to the east. Odd Fellows Cafe only lasted 7 months, re-opening as YOLO in October of that same year. YOLO had an even shorter life, closing less than two months later. On January 31st of this year, Toast, below, opened in the space. Today, the building is clean and neat and the façade is restored to its original Beaux Arts elegance. Toast, and its neighbor Shanti Yoga Shala, operate on the street level. The upper floors of the former African American lodge building hold eight two-bedroom residences. An Architectural Endeavor on Juniper St. The building at 207 S Juniper St. which was home to Key West until 2008 has a lot in common with the building around the corner which housed Sisters until very recently. 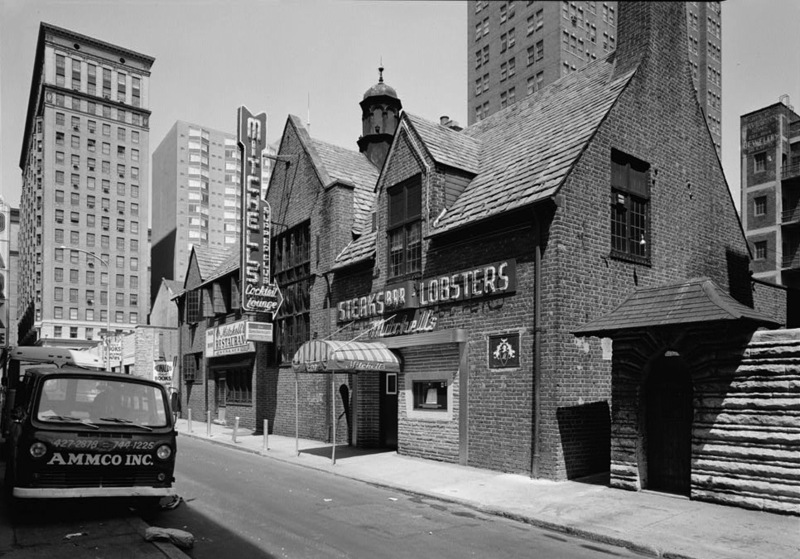 They both began as carriage houses, they both spent part of their lives as steakhouses, both owe a lot to Mel Heifetz and, unfortunately, they are both now closed. The Juniper Street building, however, took an interesting architectural detour in the early 20th century. Architects Walter Mellor and Arthur Ingersoll Meigs set up their original office in 1907 in the newly built Lafayette Building (now the Hotel Monaco), on the corner of 5th and Chestnut Streets. They were to become one of the most successful club and residential design firms in Philadelphia, designing over 130 projects over a thirty year span. 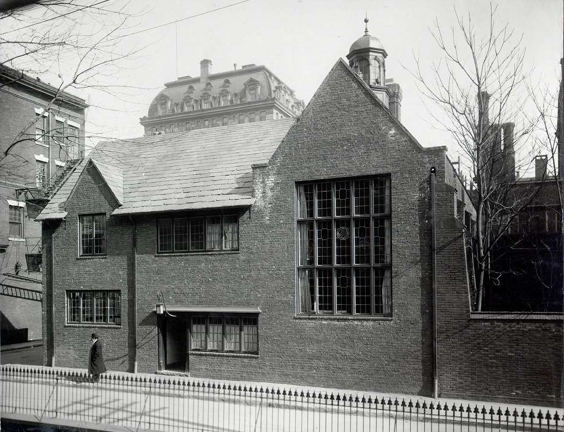 In 1912, they bought an old carriage house at 207 S Juniper Street to “reclaim” as their new offices, above. 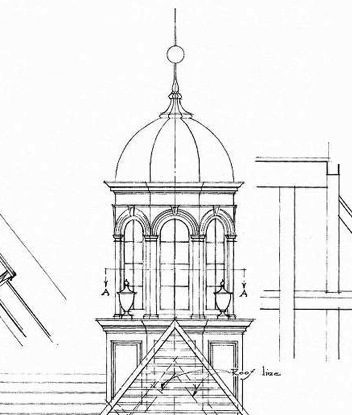 They entirely remodeled the building in a rustic, English Cotswold style, adding a large wall of small paned windows on the Juniper Street façade, another on the Chancellor Street side second floor drafting room, below, and setting a charming cupola atop the south east side. 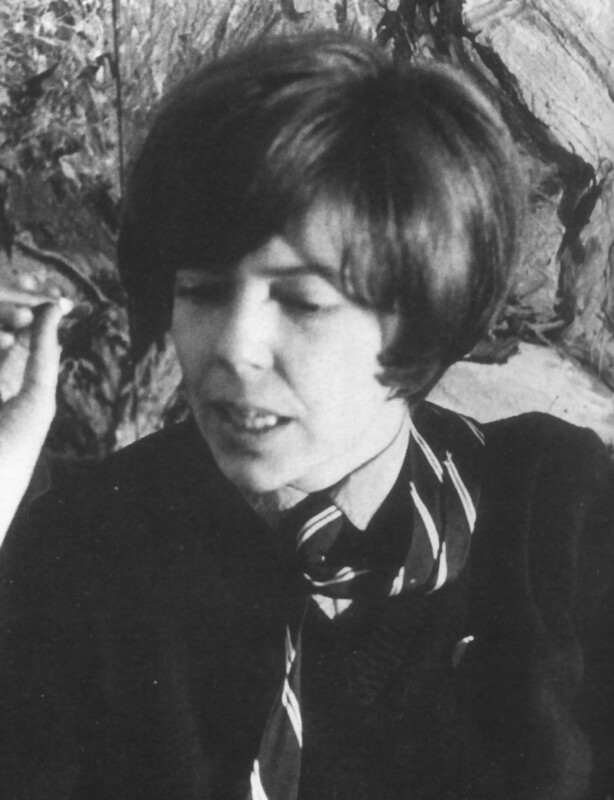 (At the time, Mellor himself was living in a stable-turned-residence in Germantown.) The whole effect was of a picturesque nostalgia for a rural past in the midst of what was becoming a busy urban commercial area. 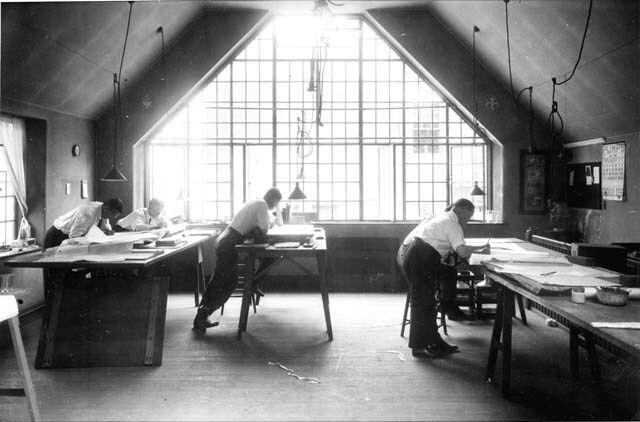 In 1915, The Architectural Record described their new offices as being part of the successful movement for the reclamation of small, hidden urban properties that was happening in Boston and Philadelphia, which the magazine called “the two English cities in America.” In 1928, their concession to 20th century technological needs was the addition of an automobile garage to the southern end of the building. 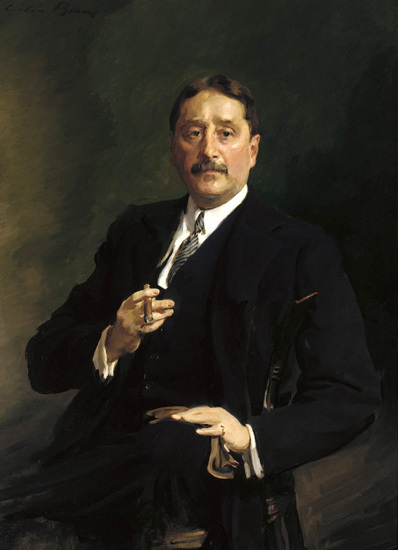 The firm prospered on Juniper Street for over 25 years, until Walter Mellor died in 1940. In 1946, the site underwent another metamorphosis and opened as Mitchell’s Restaurant, above. Mitchell’s was a solid, archetypical mid-century Philadelphia steak and seafood restaurant. It was the kind of place where couples from Northeast who came into Center City for a night out would find cocktails and a consistently good meal. For forty years, Mitchell served short ribs, brisket and boiled beef with horseradish to well dressed theatre goers. In the late 1970s, as competition grew from the innovative menus being served at the new restaurants that were part of the city’s “restaurant renaissance,” business began to drop off. Mitchell’s tried to reinvent itself in 1981, changing its classic menu to include Phila-centric dishes named “Mummers Melange,” “Ben’s Baby Lamb” and a surf and turf combo called “Penn’s Landing.” The new look didn’t work; Mitchell’s closed soon after. 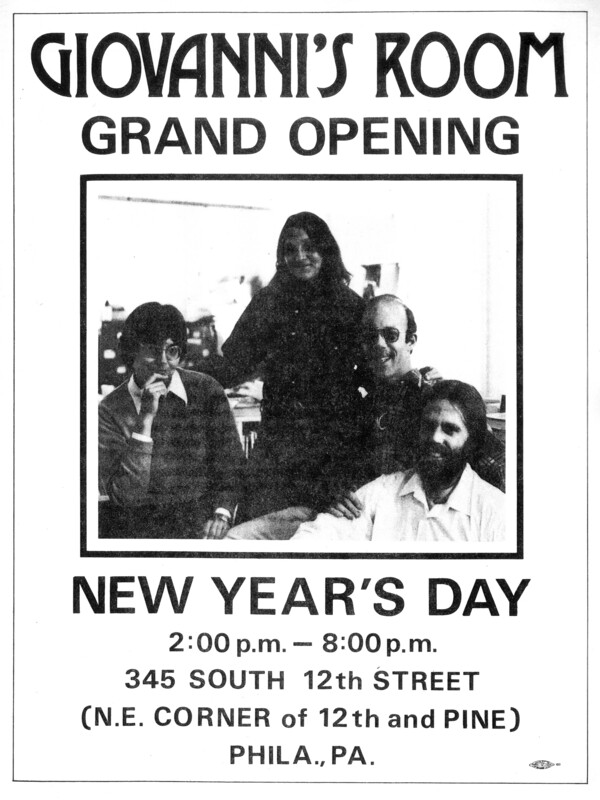 By March of 1983, the new owners of 207 S Juniper St. were advertising in the Philadelphia Gay News as Your Place…or Mine, serving a simple American lunch and dinner and showing movies nightly on a giant video screen. Your Place was only to last a few months. Below is a rare photo of the building taken during that short time. As always, click on this, or any photo for a larger image view. A stunning waterfall dropped all the way the from the top floor to the first, drawing the eye up three stories; there had been nothing like it in Philadelphia. 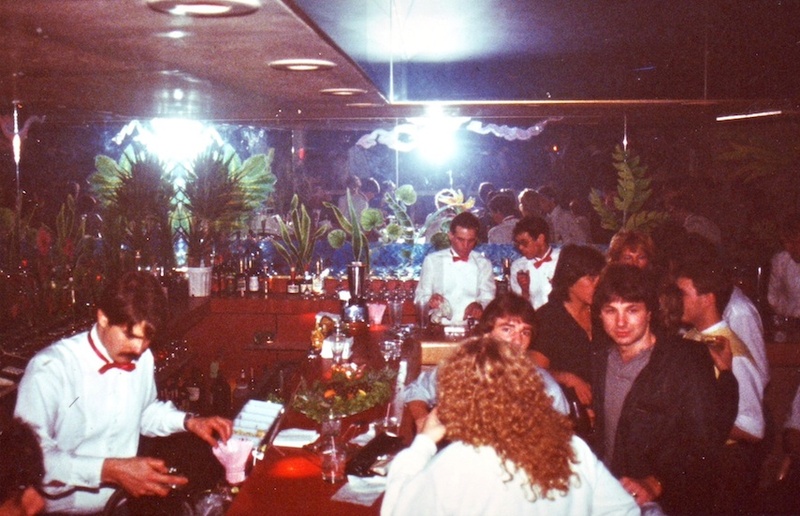 The second floor held the bar and disco and on the first floor was the dining room, below, and cabaret. 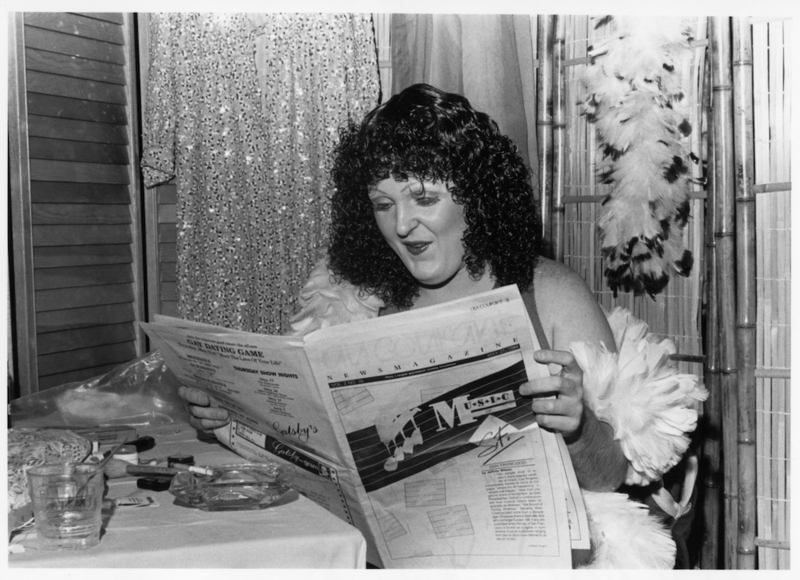 The cabaret featured local and national performers like Big Ed and his oversized cowboy hat; Mr. Ruby Rims, Amy Ryder; Carol O’Shaughnessy; and Jewish lesbian entertainer Lynn Lavner. 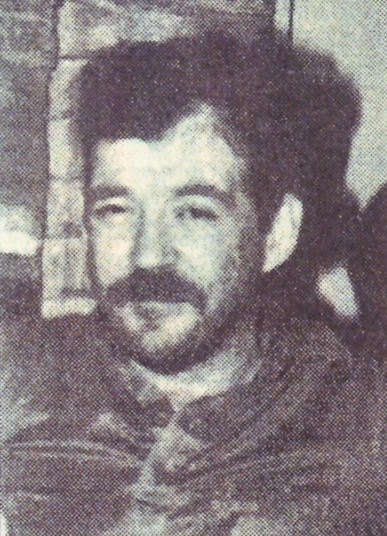 Key West’s first manager was Richard McPeake, who was involved in the management of several Gayborhood clubs and who also wrote a column for Au Courant newspaper. 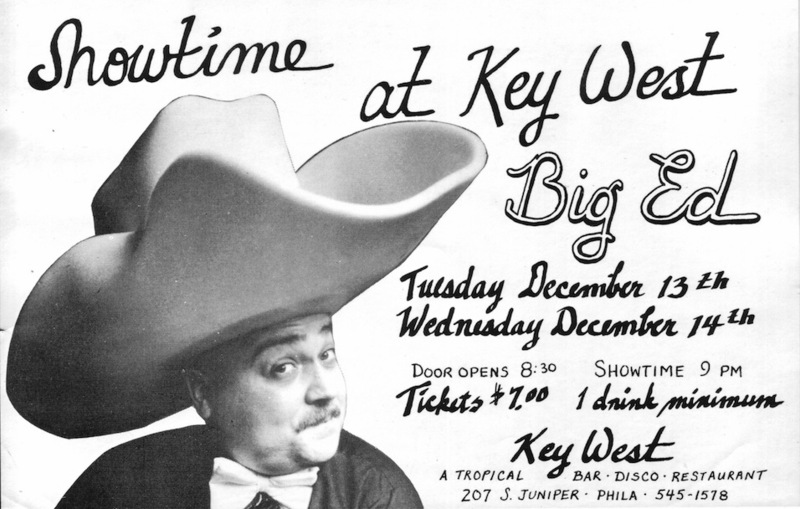 From the late 1990s through 2008 when it closed, Key West was owned and operated by Chick Winn. 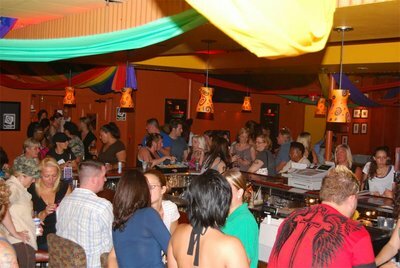 With a sports bar, two pool tables, a second floor disco and a top floor Sky Lounge, it served a far more eclectic clientele than many Gayborhood bars. It’s been shuttered for five years now. According to an article here last by fellow blogger Sandy Smith, the property was in the hands of Mark Bee, owner of the Silk City Diner on Spring Garden street. There was some activity there several months ago; the old signage was removed and the façade cleaned up, but things have been quiet lately. It’s one of those quirky, tucked away downtown buildings that does so much to give Center City a charming livability. It deserves a restoration and a new life. Very special thanks to Mel Heifetz and Jim Ross who took the time to share their memories and photographs of Key West with me. 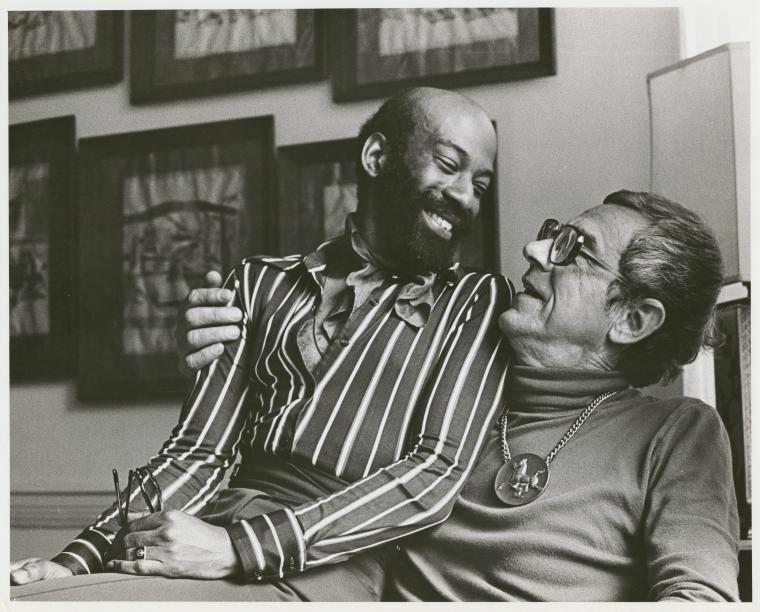 The exhibit, called “Private Lives in Public Spaces: Bringing Philadelphia’s LGBT History Out in the Open,” is at the Philadelphia History Museum at the Atwater Kent at 15 S. 7th Street near Market. This may be the first significant LGBT exhibit in a mainstream venue in Philadelphia, so it’s a milestone for the community. I was lucky to work on this project with the wonderful WWCC Director of Services, Candice Thompson; talented designer Zach Mosley; and the insanely creative Emmett Ramstad. “Private Lives” will run until the end of October, 2013. Don’t miss it. There’s more information on the WWCC website here. 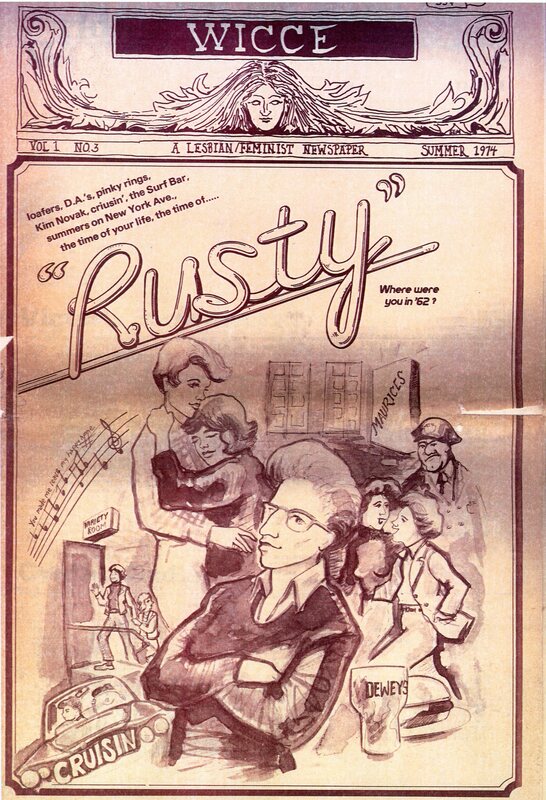 Rusty’s: Where Were You in ’62? 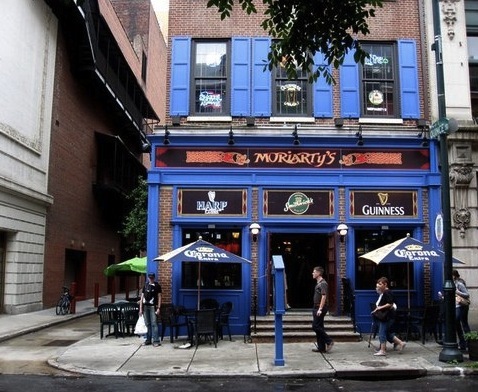 With this post we’re back on Quince and Walnut Streets, where today you can enjoy a fine burger and a Guinness at Moriarty’s Irish Pub, the former home of Philadelphia’s most famous lesbian bar – Rusty’s. 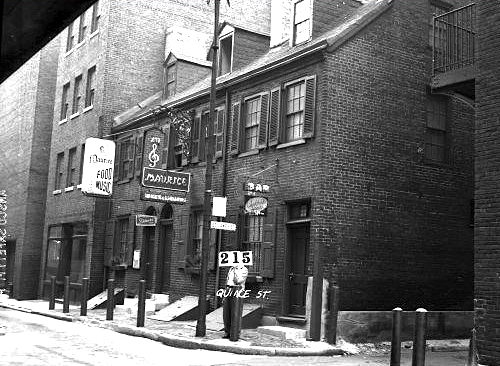 Although today we think of most of Walnut Street as a commercial thoroughfare, like most Philadelphia streets, it began as a residential area. By the 1890s, so many homes had been converted to shops that the city began removing all the stoops to the buildings on Walnut within a few blocks of Broad St. to make more room on the sidewalks for shoppers and to provide easier access to the businesses. Below is a photo of the south side of Walnut Street in February of 1927. Just a few months later, most of these buildings would be demolished and construction would begin on the Forrest Theatre. The ornate buildings on the far left were the Turkish and Russian Baths. More research needs to be done on the Turkish baths that served Philadelphia business men in the 19th and early 20th century and their place in the gay subculture. I’ve only come across one reference to them in a Vice Commission report in 1913, where a hotel bellboy tells the Commission that “now that there’s been a crackdown on prostitutes in the city, the fairies in the baths are getting bolder.” There is a lot more history to explore behind that quote. The building with the white sign three doors down to the right at the southeast corner of Walnut and Quince, was the Davis and Harvey auction house. 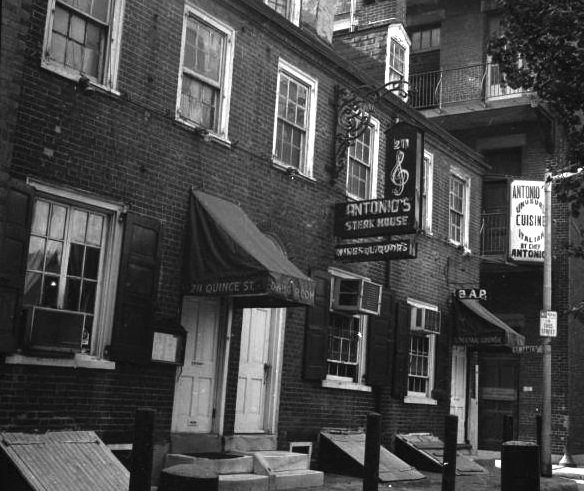 On the far right, at 1116 Walnut St., is the building where Moriarty’s now operates. It was home to the W.F. Jones tailoring business for the first few decades of the twentieth century. When the Forrest Theatre was completed in 1928, it changed the tone of the neighborhood. Restaurants catering to the theatre patrons sprung up at 202, 204 and 211 S Quince St. (See the histories of the restaurants on S Quince St. in this blog archives under the Quince St. category.) In the late 1940s, the business became the Café Footlight. You can still see the old “Café Footlight” sign painted on the wall in the photo, left from 1958. By the time this photo was taken, the name had changed from the theatrical Café Footlight, to the very fifties Star Lite Café. About 1963, the bar became known as Barone’s Variety Room. The main entrance to the restaurant and bar was on Walnut Street, but if you went around to the Quince St. side of the building, through the side door and up the stairs, you were in Rusty’s. A small sign over the door on Quince Street, a little alley next the Forrest Theatre, says “Variety Room.” It’s very quiet as you go up the old wooden steps to the second floor and down the long corridor. You don’t hear the juke box until you’re actually in the room. You pay the $2 minimum to a woman in a white button-down shirt and slacks who looks a little like a gym teacher you once had, and she gives you a strip of tickets for drinks. It’s a smallish panelled room with a bar at one side and lots of tables clustered around a dance floor. At first, the relaxed atmosphere and informal dress and young girls make you think of a girls college hangout in a small town. The matches, above left, are from the cigarette machine in Rusty’s. With their 1960s pin-up girls and phallic rockets, (the one on the right is limp! ), they are two of my favorite objects in the William Way Community Center’s archival collections. 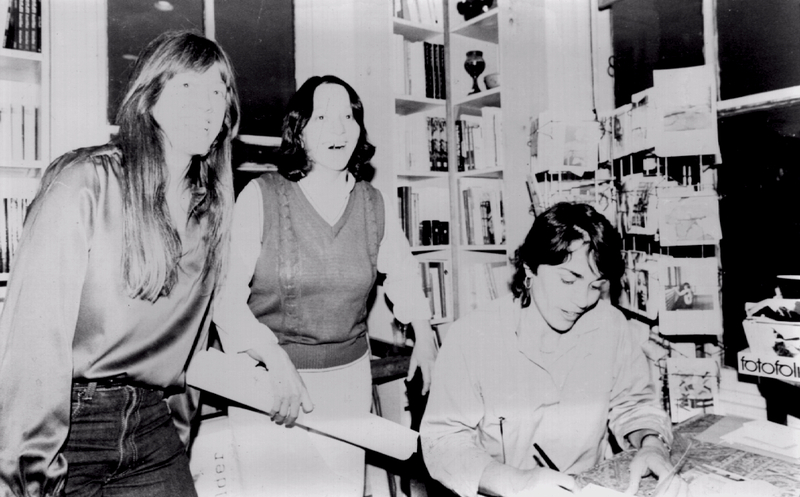 On the night of March 8, 1968, a year after “The Invisible Sorority” appeared, women out for a drink at Rusty’s suddenly found the jukebox unplugged and the house lights brought up. It was a police raid. 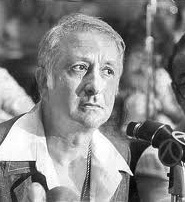 Under Police Comissioner Rizzo, raids on gay and lesbian bars were an all too common occurence in 1960s Philly. Many of the women were verbally abused; police accused them of being drunk and disorderly. Some were booked and held overnight. They were brought before a magistrate the next day, but all charges were dropped. It was a clear-cut case of police harrassment. In May, the D.O.B. arranged a meeting with the Philadelphia Police Inspector and they brought along an ACLU observer. The D.O.B. let the Inspector know that they represented the community and that they were were not afraid to protest violations. The police issued a statement that “homosexuals have been, are now, and will be treated equally with heterosexuals.” Because of their active support in the incident, membership in the Philadelphia D.O.B. increased dramatically. 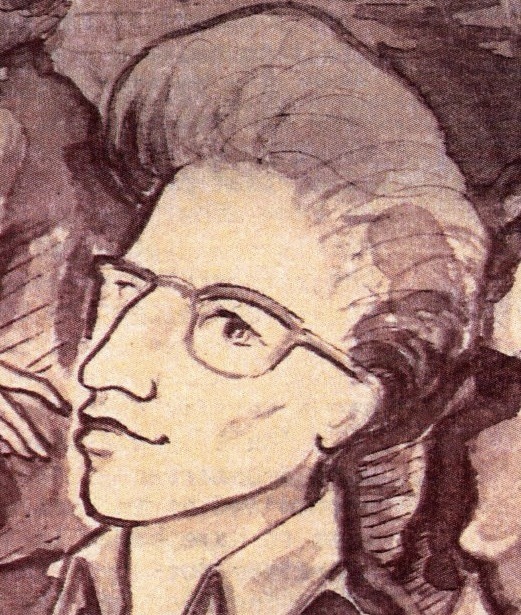 A year before the Stonewall riots, the raid on Rusty’s and the reaction of local lesbians was a success story for gay rights. ● Matchbooks and cover of Wicce courtesy of the John J. Wilcox Jr. Archives at the William Way LGBT Community Center. * Some details of this entry have been corrected on July 11, 2013, thanks to input by Ada Bello. 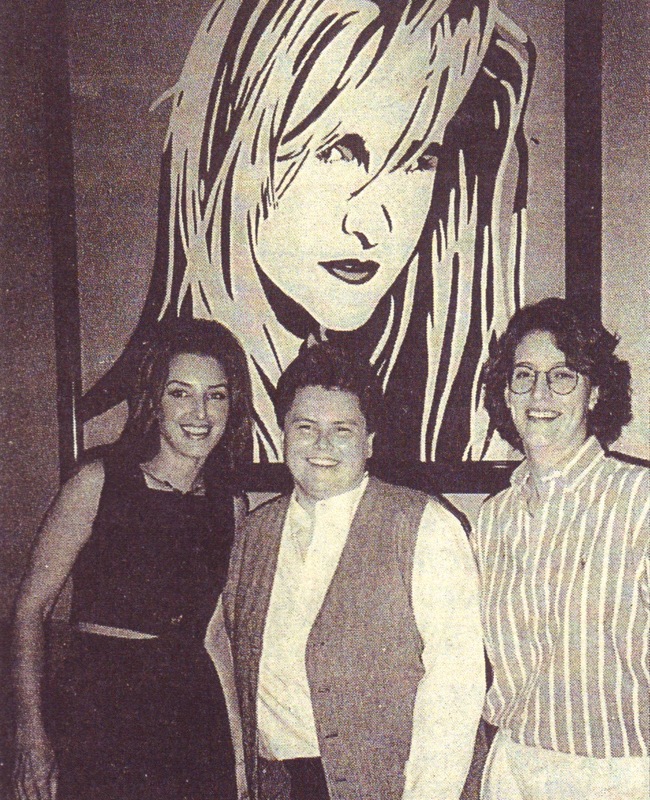 Also, according to Ada, portrait artist Susan Schary painted several of Rusty’s patrons, Lourdes Alvarez and Ada Bello among them, as well as Rusty Parisi’s. The whereabouts of the latter is not known. It’s time again to explore one of those holes in the fabric of the Gayborhood. This time it’s the E-Z Park lot at 1311-1315 Locust Street, in the center of the block, across from the Library Company. It would be hard to identify the location of the 1885 photograph, above, on today’s Locust Street, since every one of the buildings in the photo is now gone. This is the northeast corner of Locust and Juniper Streets, looking east. The building on the left, on the northwest corner, was a wonderful Frank Furness designed Library Company building, razed in the late 1930s, a victim of the Great Depression. In its place now stands the dingy four level parking garage next to Mamma Angelina’s pizzeria. In the center was the Universalist Church of the Messiah, designed by Thomas Ustick Walter, the Philadelphia architect famous for designing the dome of the Capitol Building in Washington D.C. Both the church and the next few rowhouses beyond it to the right were torn down around 1894 for two elegant new urban residences, below, designed by Wilson Eyre Jr.
By the 1890s, the Historical Society had already moved onto the corner of 13th and Locust, the College of Physicians was diagonally across from that and the Library Company was in the building mentioned above at Locust and Juniper. Directly across the street from the Library, where the Sylvania is today was the Episcopal Academy. It was appropriate that Eyre designed two buildings in this intellectual neighborhood for archaeologist and writer Clarence B. Moore and the brilliant paleontologist Joseph Leidy, who was called “the last man who knew everything.” Locust Street was going upscale and highbrow. 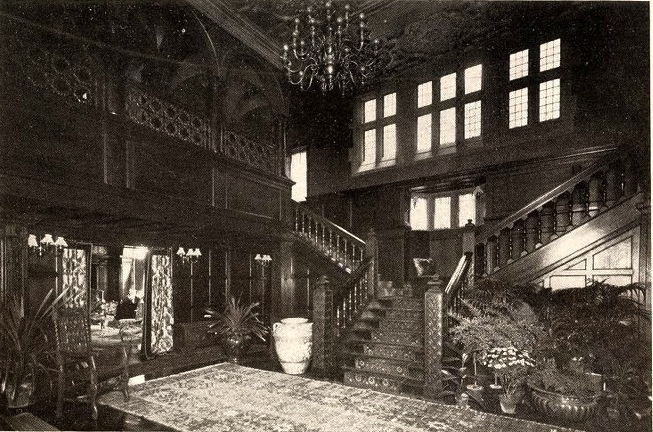 When wealthy banker and financier Clement B. Newbold, left, was planning a city home for himself and his young bride to complement their Jenkintown estate, he would hire architect Frank Miles Day, who had worked with Eyre, to build an immense townhouse on the double lot at 1313-1315 Locust Street next to the Leidy residence. Moore’s wife, the former Mary Scott, right, was the socialite daughter of the President of the Pennsylvania Railroad, Thomas A. Scott; their combined fortunes were substantial. The couple spent two months traveling on their honeymoon in early 1897 while the Locust Street house was being completed. When it was done, it was acknowledged to be one of the most handsomely furnished houses in the city. The façade of the house presented a formal central entrance flanked by two bays which housed a library and reception room. The entrance hall opened onto an incredible two story central hall and a dramatic double staircase, below, leading to the upper floor. Beyond the grand hall were a drawing room, dining room, breakfast room and a garden that wrapped behind the Moore and Leidy houses next door. Some of the buildings where Key West was until a few years ago were stables to this house. Their life together was a whirlwind of Philadelphia Dancing Assembly balls, concerts, Horticultural Society functions, summers in Bar Harbor, Maine and winters in the Carolinas. Mary was a beauty and the darling of what the newspapers called “the young social set.” Their life seemed golden. 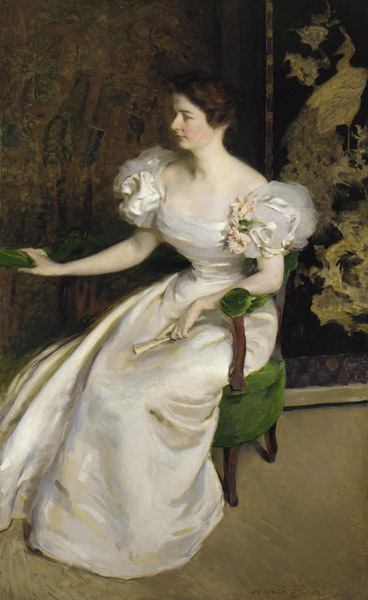 The dream came crashing down for the couple in 1905, when, while recovering from an appendicitis operation, Mary suddenly died. From then on, Clement spent less and less time at the large, empty house on Locust Street. 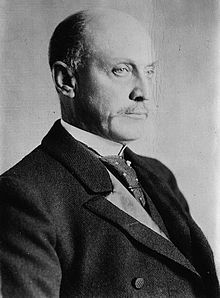 In 1909, Newbold leased the house to his distinguished friends, Mr. and Mrs. Charlemagne Tower Jr. Charlemagne Tower, left, taught history and archaeology at the University of Pennsylvania and had had a long diplomatic career, serving as Minister to Austria and as Ambassador to both Russia and Germany. 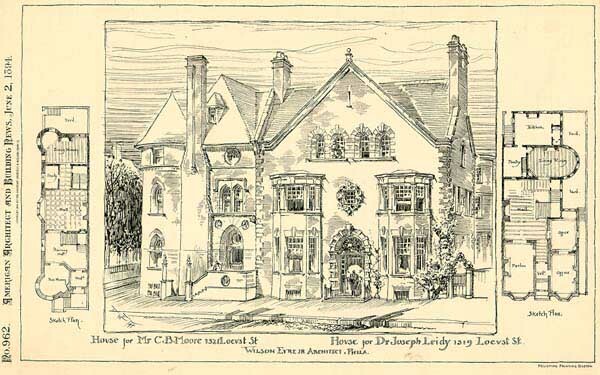 The Towers were friends with Leidys next door and were prominent members of Philadelphia’s social scene. At the beginning of World War I, Mrs. Tower turned their city residence into a meeting place for the American Red Cross. The Towers lived there happily with their daughters until 1916, when tragedy again visited the house, and the twenty year old youngest daughter, Gertrude, was killed when an automobile she was riding in overturned in Fairmount Park. The family retired from the Philadelphia social scene to their summer home in Waterville, NY and 1315 Locust Street was left in the charge of a caretaker. The house stayed mostly vacant for about 6 years. In 1916, the police reported that intruders had broken in on Christmas night, helped themselves to a turkey dinner and several bottles of the best wine and made off with some of the silver. 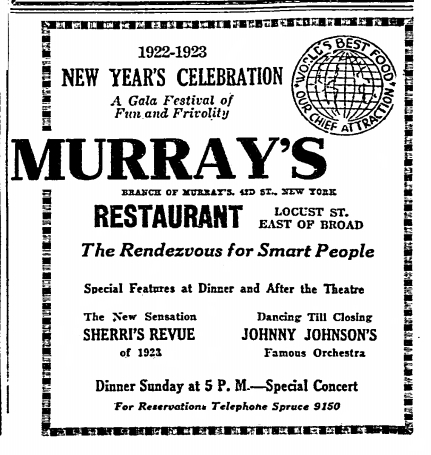 In December of 1922, an Inquirer ad, right, announced that the former Tower home, scene of so many highbrow society functions, was going to open as Prohibition-era Philadelphia’s newest jazz venue, to be called Murray’s, “The rendezvous for smart people.” It would be a branch of the famous Murray’s Cafe in New York, with after-theatre entertainment, including a revue featuring 26 chorus girls under the direction of Broadway designer Andre Sherri. 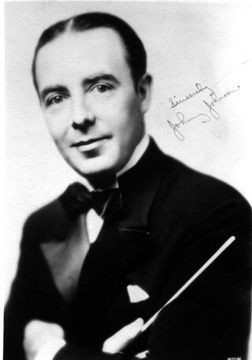 The venue opened the day after Christmas in 1922, packed with members of society and city officials who could dance to the music of Johnny Johnson, left, and his Orchestra. 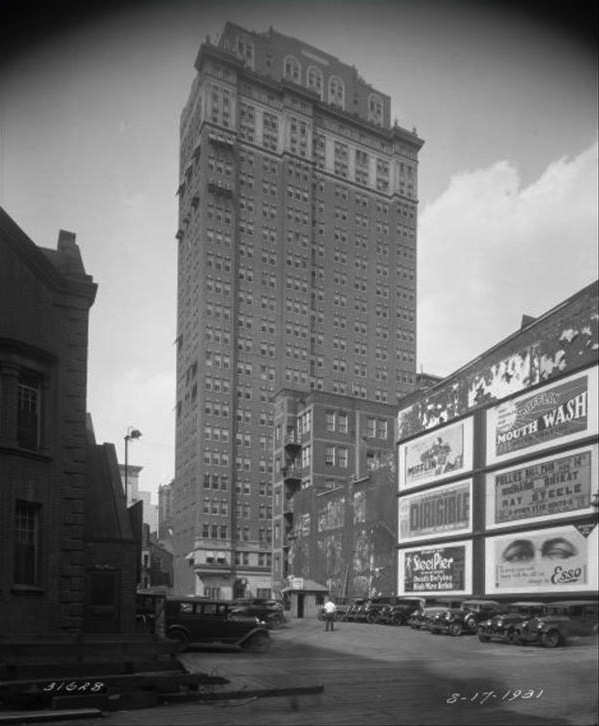 The proximity of Locust Street to the first-class hotels and theatres on Broad Street made it the perfect locale to become a small late night entertainment district. Murray’s was the first music cafe to open on Locust, long before the many “musical bars” that would open there after World War II that would later turn into gay bars. 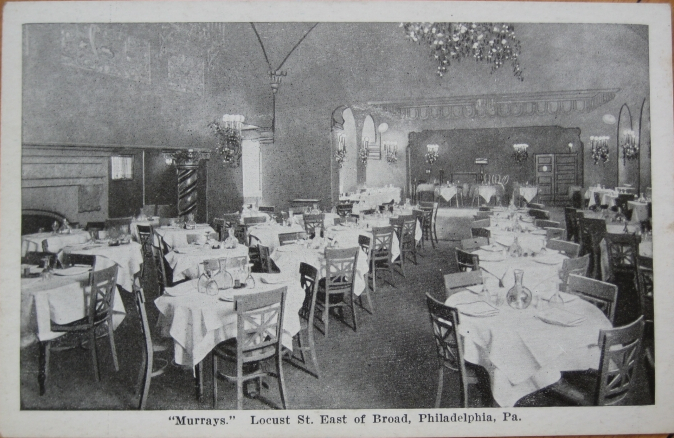 In the mid 1920s, Murray’s Cafe became the swanky Club Madrid, run by Joe Moss, and was reputedly one of Philadelphia’s 12,000 Prohibition era speakeasies. Club Madrid lasted only until about 1930, a victim of the end of Prohibition and the beginning of the Great Depression. 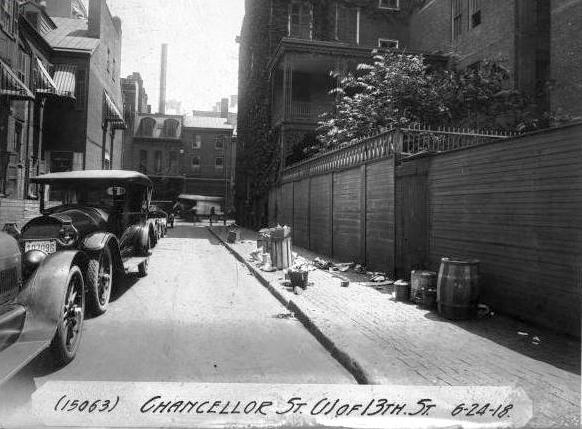 By 1931, the huge, expensive-to-maintain building was razed, right (that’s the Chancellor on 13th in the background). 1313-15 Locust Street was a residence for the city’s elite for 25 years, a Prohibition era jazz club and speakeasy for 10 years and now it’s been a parking lot for over 80 years. In this picture, below, from 2011, you can also see the short-lived JR’s Lounge, now Spiga, on the right. In Philadelphia, buildings and businesses come and go, but parking lots are forever. 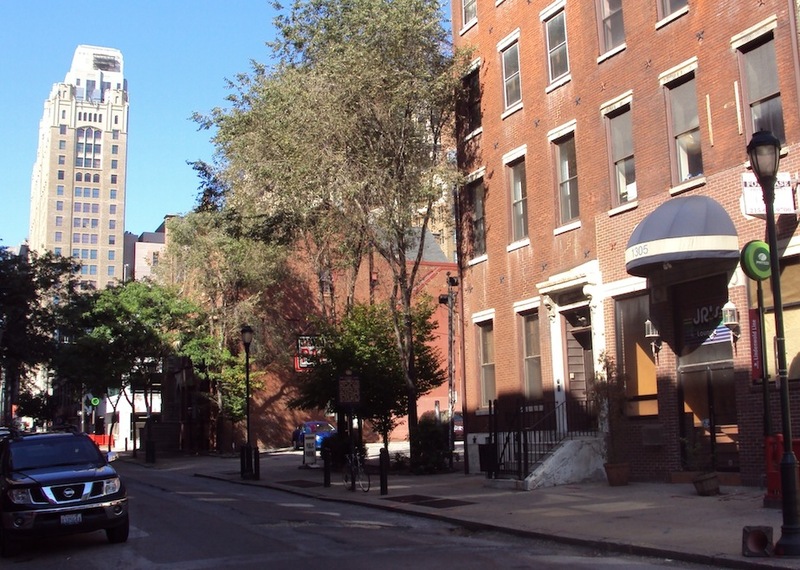 Last time, I began the story of the short stretch of the east side Quince Street between Walnut and Locust Streets – sometimes straight, sometimes gay, but always interesting. We traced it from the 1920s Blue Lantern Tea Room, through its life as Maurice’s, Antonio’s, the Foster House and Flippo’s in the 1970s. 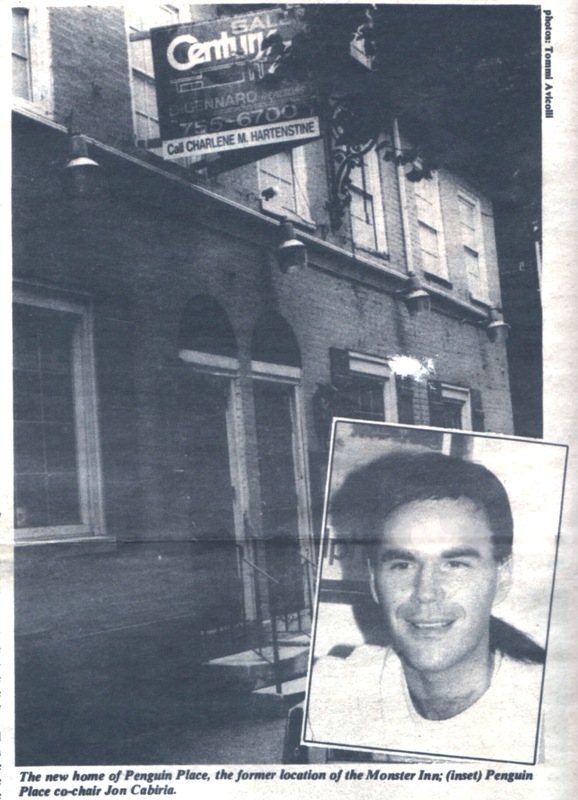 In the early ’80s, now called the Intermission Tavern, the restaurant ended up in a 48 page exposé published by the Pennsylvania Crime Commission. The Commission cited violations that included numerous violations of the state Liquor Code and ownership and use of the site as a meeting place by organized crime associates, some with criminal records. In a secret bugging operation, the FBI phone taps and hidden cameras discovered that the Intermission was being used as the headquarters for loan sharking and drug dealing operations by mobster Raymond “Long John” Mortorano, right, and union boss Albert Daidone. Their methamphetamine and Quaalude trafficking network was estimated to have an annual worth of between $50 and $100 million. Mortorano and Daidone were both eventually implicated in a murder that was part of a battle for control of Atlantic City’s 10,000 member bartender’s union. The city shut the Intermission Tavern down in 1982. After serving 17 year prison sentences, Daidone and Mortorano were released in 1999. Daidone retired from mob life, but Mortorano was gunned down in his Lincoln towncar during rush hour in South Philadelphia in 2002. On April 5, 1985, after three years as co-owner the new Bike Stop at 206 S Quince, Ron Lord, right, with partner Roland Frambes, opened a restaurant across the street at 211 S Quince St called The Monster Inn. Jim Madden, who would buy the Bike Stop in 1997, got his start in Philadelphia working at the Monster for Lord. The Monster Inn was named after the chain of “Monster” bars in Cherry Grove, Key West and Sheridan Square in New York, but apparently was not associated with them. (If anyone knows the story, please let me know!) 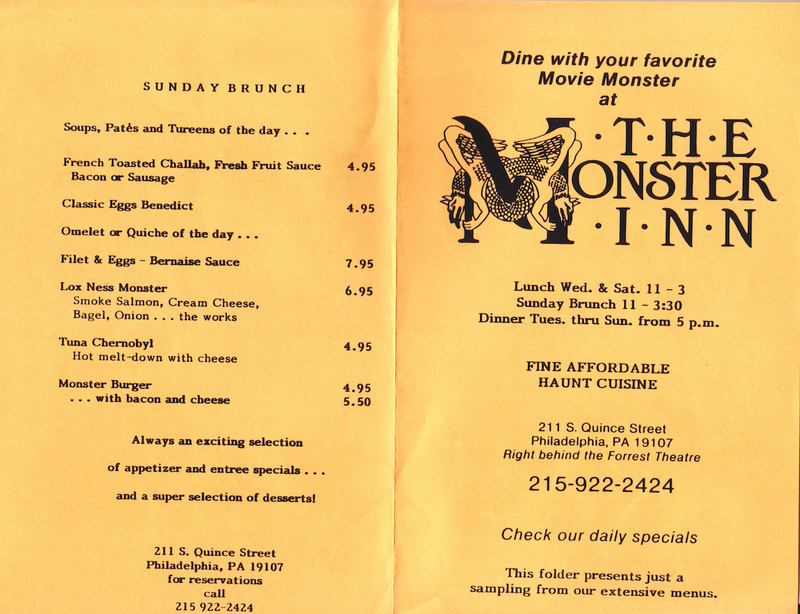 The Monster featured a menu sprinkled with with items humorously and ghoulishly named, in keeping with the theme, like “Decapitated Coffee” and the “Lox Ness Monster,” served at brunch; see the sample menu, below. The Monster catered to cast members and theatre-goers from the Forrest Theatre and advertised to a gay clientele as well. 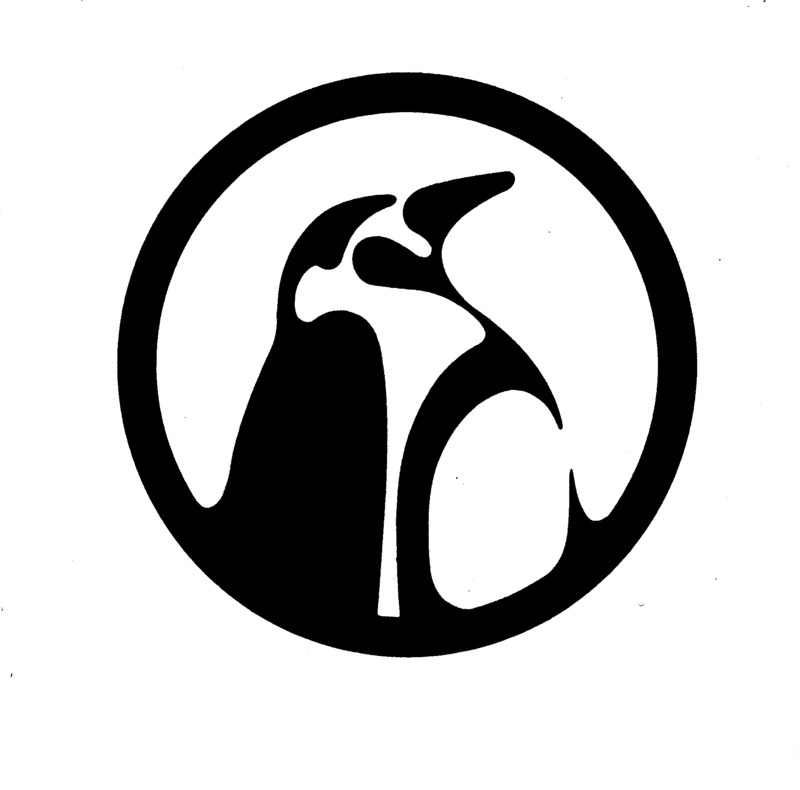 For five years in the mid 1980s, the Gay Community Center of Philadelphia (GCCP) miraculously existed without a building as Penguin Place, “The Community Center without Walls,” logo at top of post. 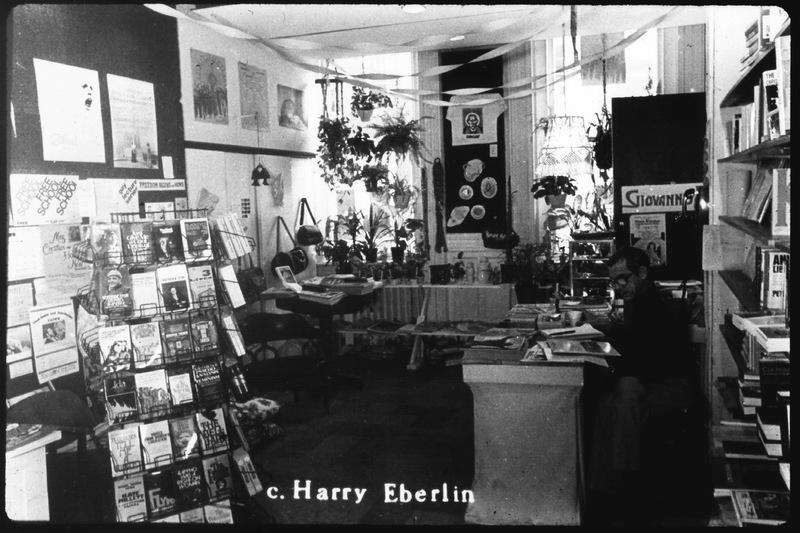 In the fall of 1988, the Center’s Board decided that they needed a physical space again. In December, they signed a lease with Ron Lord, owner of the Bike Stop, to rent 211 S Quince Street, the former home of his Monster Inn, right. The GCCP Library and Archives began moving in right away. Within a few months there were problems; it seems Ron Lord’s original lease didn’t allow him to sublet. Furthermore, the building seemed to be in the name of an 80 year old Italian woman in South Philadelphia, which hinted that the building’s organized crime connections were still very much there. During this minor crisis, GCCP Board Members Marge McCann and Michael LoForno worked heroically to keep the Center together. By the time things were worked out, there was some contention among the GCCP Board, inflammatory press added to the problem and Center co-chair John Cabiria resigned. In addition, in early February of 1990, there was a fire in the back of the building, most probably set by a homeless person. Coincidentally, soon after, plans for a new location were announced. 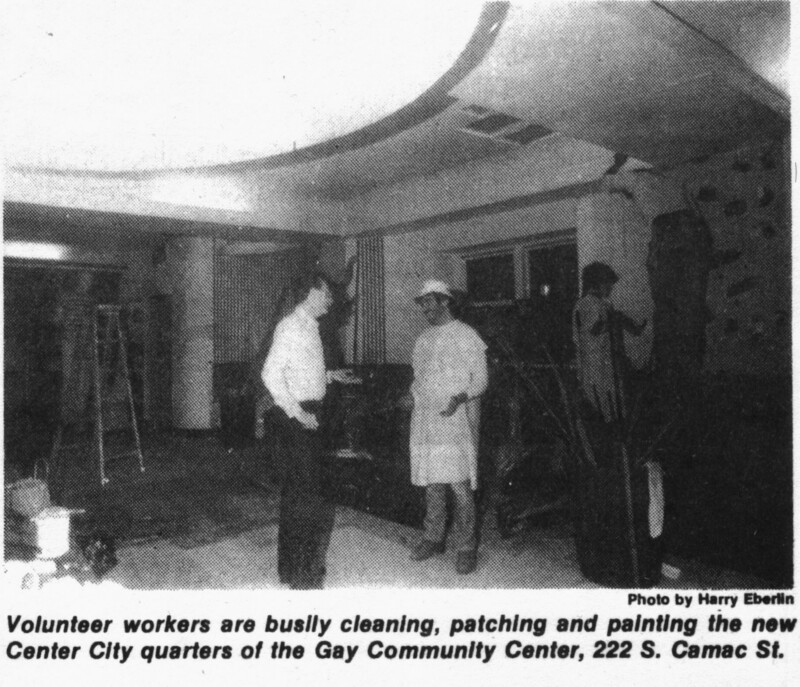 The Community Center moved on to 201 S Camac St. and seven years later, to its current home at 1315 Spruce Street, the first building that the Community Center has owned. The buildings lay empty for a long time, until a few years ago, when they were once again separated into three private residences, restored and sold. Today, the three simple brick façades at 211 to 215 S Quince St., with their tiny marble stoops, tasteful, dark green doors, fanlights and shuttered windows, left, look pretty much they way they did when they were first built about 1850. There’s no hint at all of the long succession of tea room, restaurant, gay bar, mob hangout, gay bar again and community center they housed in the last hundred years. • For more information on the Bike Stop, see “T-Squares and Bootblacks: The Bike Stop,” on this blog. • For more information on the William Way Center, see “A Home for the Community Center,” Part I, Part II and Part III, on this blog. A 1922 article in the Philadelphia Inquirer about the tiny stretch of Quince Street between Walnut and Locust Streets called it “. . . a tinge of the Philadelphia of old, crowded but not wholly crushed,” and even then, almost a hundred years ago, the tiny houses that lined it were already being referred to as “ancient dwellings.” The picture of one of the buildings that accompanied the article, below, right, would be hardly distinguishable from one taken today. 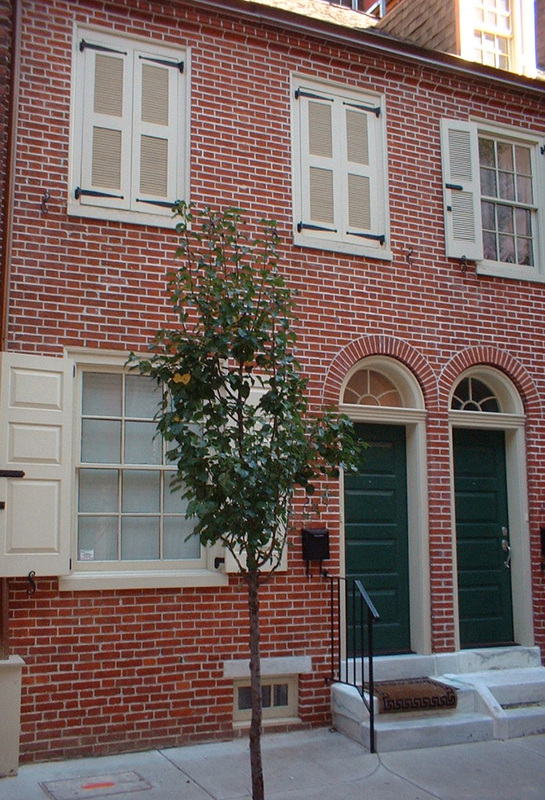 Narrow Quince Street, running only four blocks from Walnut to Lombard Streets, first appeared in Philadelphia City Directories about 1813 as “Quince Alley.” By 1816, it was a full-fledged street, home to a racially mixed working class population of carpenters, waiters, dressmakers and coachmen. By the early 20th century, not unlike other small by-ways in the older part of the city east of Broad Street, it had become a bit shabby. Seventy year old fireplaces were bricked up, ornate woodwork was lost under layers of heavy paint and motley layers of wallpapers covered the original walls, much like what was going on in Society Hill. Well into the beginning of the 20th century, William J. Beattie, who lived at 208 S Quince, right next to where the Bike Stop is today, held the honor of being one of the last horse-shoers in the city. 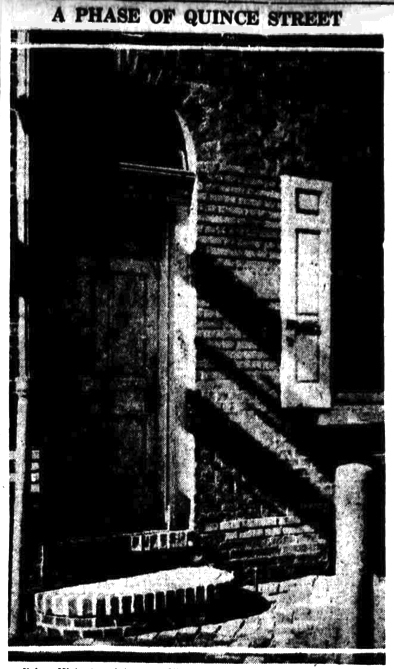 In the early 1920s, a prosperous Philadelphia dentist named Dr. Eugene Pettit, went though a nasty, much publicized divorce and bought the three two-story rowhouses with dormers at 211, 213 and 215. He moved out of his Clinton Street home and into the top floor of 213, restoring much of the interior to its early 19th century glory and filling every corner of the attic space with the antiques, engravings, porcelains and furniture he had collected. The houses on either side, he rented to an antique dealer and to offices, but the ground floor of 213 Quince became the Blue Lantern Tea Room. Tea rooms, like the contemporaneous Venture Tea Room on Camac, served “dainty lunches” and light dinners to well-heeled club women in the city. 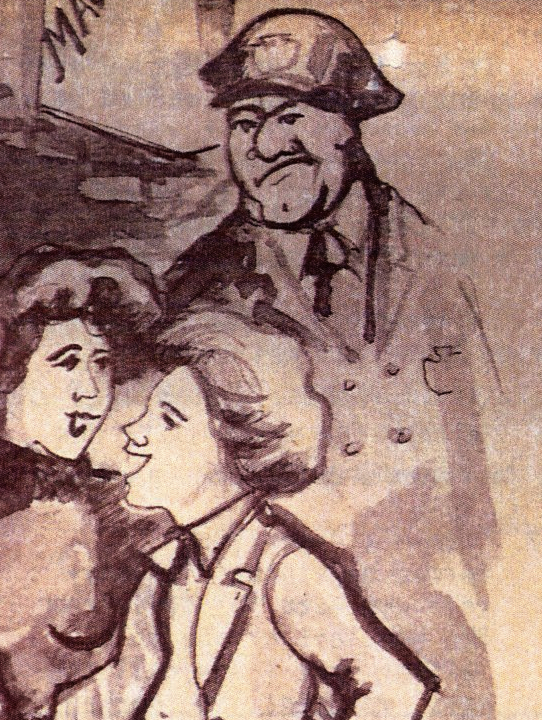 The Blue Lantern, as you can see in the 1922 illustration, left, by artist Frank Taylor, was marked by the large –you guessed it– blue lantern that hung outside until World War II. 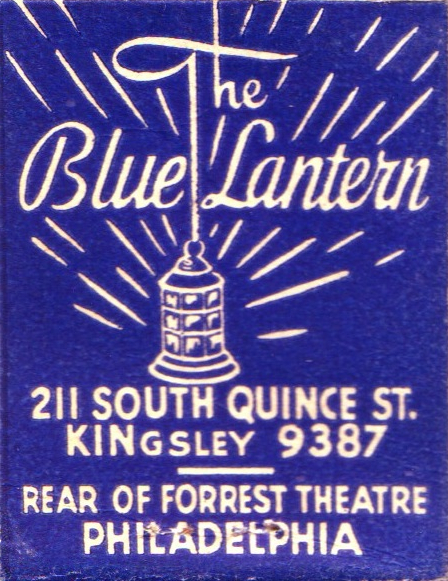 The Blue Lantern matchbook cover at the top of this post probably dates from the early 1930s, after the Forrest Theatre opened in 1927 on Walnut Street. Maurice Rotenberg, grandfather of chef Marc Vetri, began his restaurant career in the 1940s, with a small lunchroom in Center City. A great lover of classical music, he decided to replace the pop tunes in his juke boxes with classical selections. The idea was a huge hit. 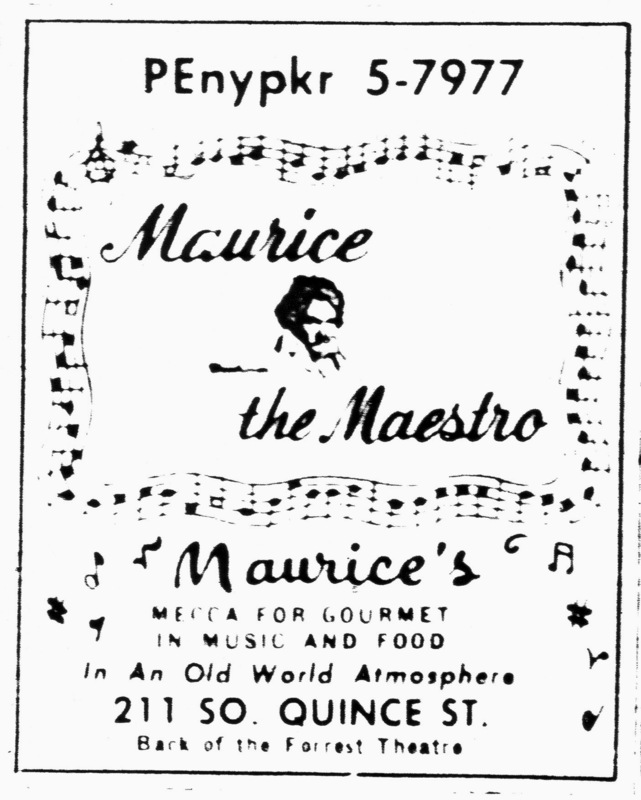 In 1948, he bought the three building complex including 211 Quince Street, broke through walls and opened Maurice’s, above, an “Old World” style restaurant wired by technicians from Philco to pipe classical music throughout the nine tiny dining rooms, including the “Beethoven Shrine” on the third floor. 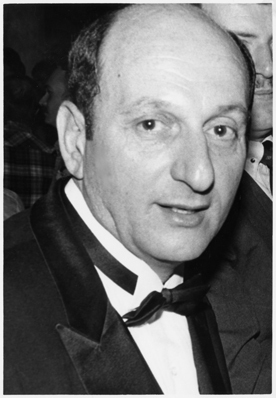 In the 1950s, celebrities like Eugene Ormandy, Tony Randall and Sammy Davis Jr. would drop in for lunch and to hear some of Rotenberg’s collection of over 30,000 classical records. After Maurice died in 1952, his wife Gussie ran the place for ten more years before retiring. Long before Philadelphia’s restaurant renaissance in the 1970s, Maurice’s was offering a gourmet “J.S. Bach Club Sandwich” served up with the latest recording of Beethoven’s 9th Symphony. 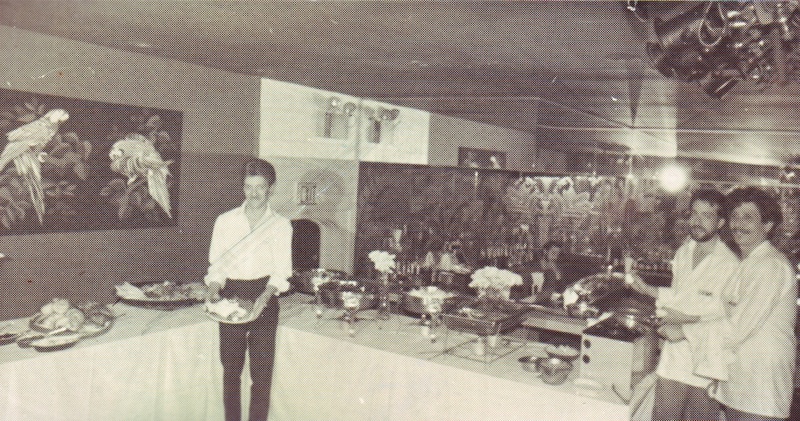 After Gussie left, the restaurant briefly became Antonio’s, serving Italian cuisine and steaks from about 1968 to 1971. You can see, below, that Antonio’s left Maurice’s signature treble clef on their sign, simply adding “Antonio’s Steak House” below it. Still relying on the patronage of the theatre crowds from the nearby Forrest, the business would go through several name changes in the 1970s, from Antonio’s to the Foster House, to Flippo’s then to Curtain Call. 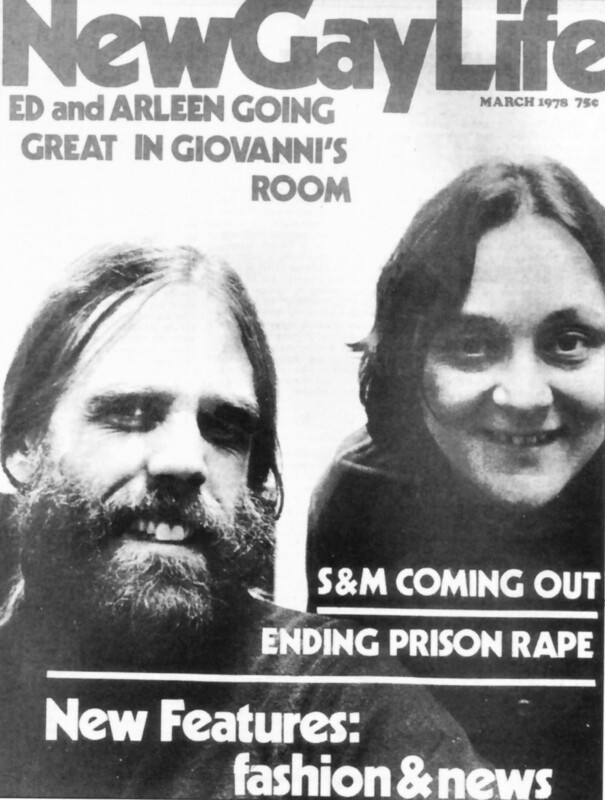 Both Foster House and Flippo’s are listed in gay guides and Foster House had the honor of appearing in 1972’s “Gay Today” article by Art Spikol, which also mentioned the Horizon House, see the last post, below, February 28. 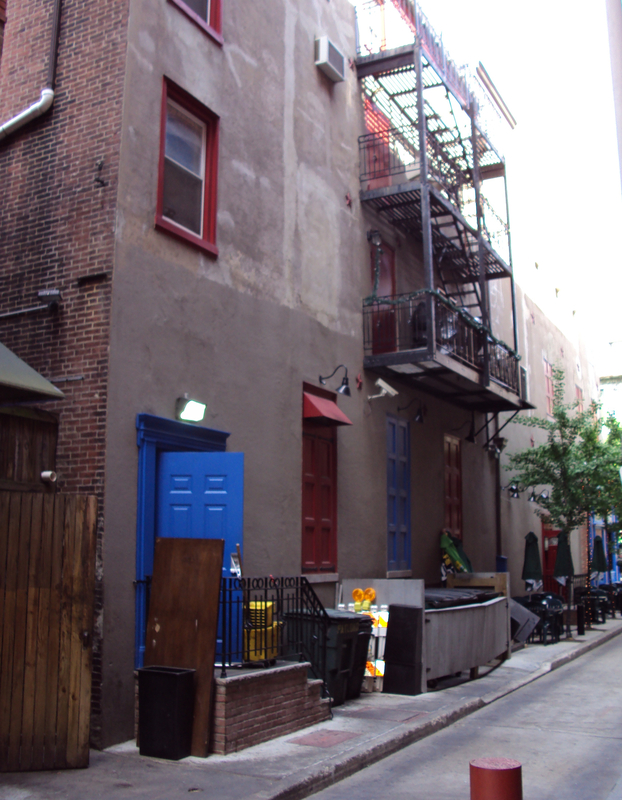 The 200 block of South Quince Street is not much bigger than an alley, and runs between 11th and 12th in center city. There is a parking lot on the corner and a few bars on the street–one of which, called the Foster House, is small and quaint, and at night, with its colored lights shining on the sidewalk, surrounds itself with the slightly unreal, super-animated aura of a Disney movie. It is only eight o’clock, and the Foster House is still relatively empty–two guys talking quietly at the bar, a lesbian couple at a nearby table. The walls are covered with a planned graffiti, and the black-light illumination makes white glow purple. A fun house, with nooks and crannies and little steps leading to a small room in the rear where our meeting is to take place.